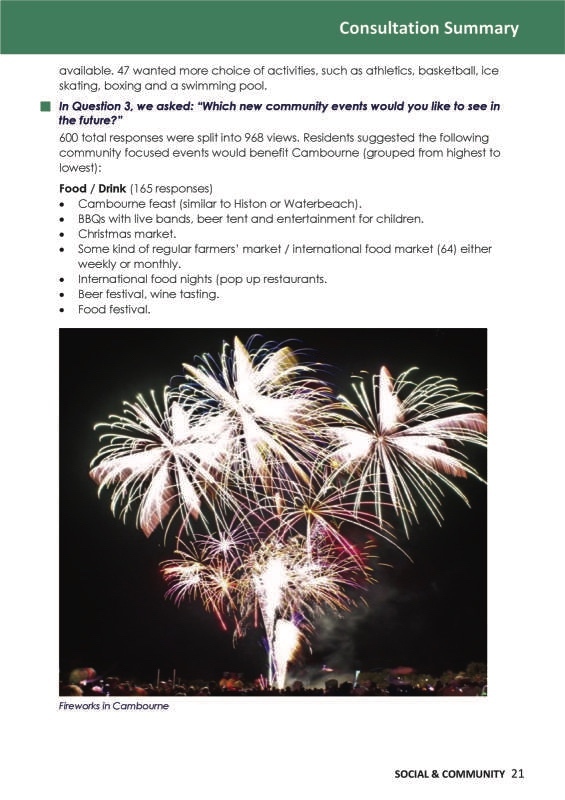 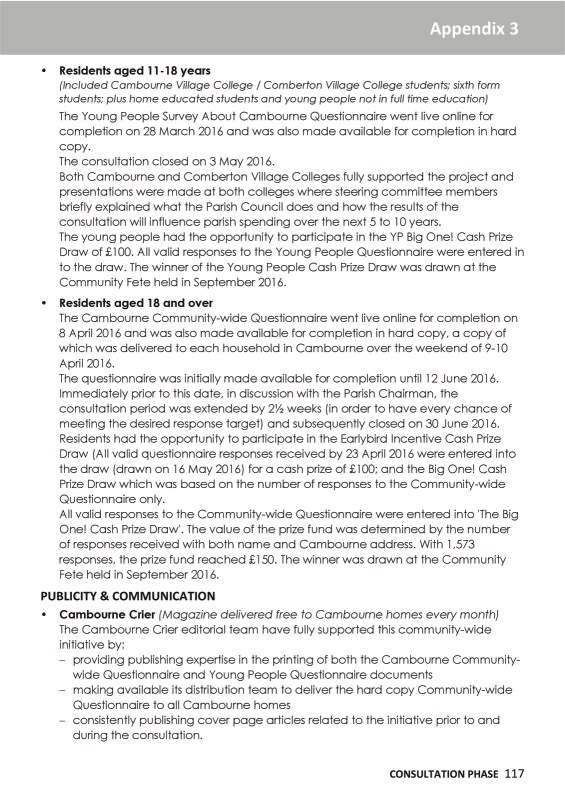 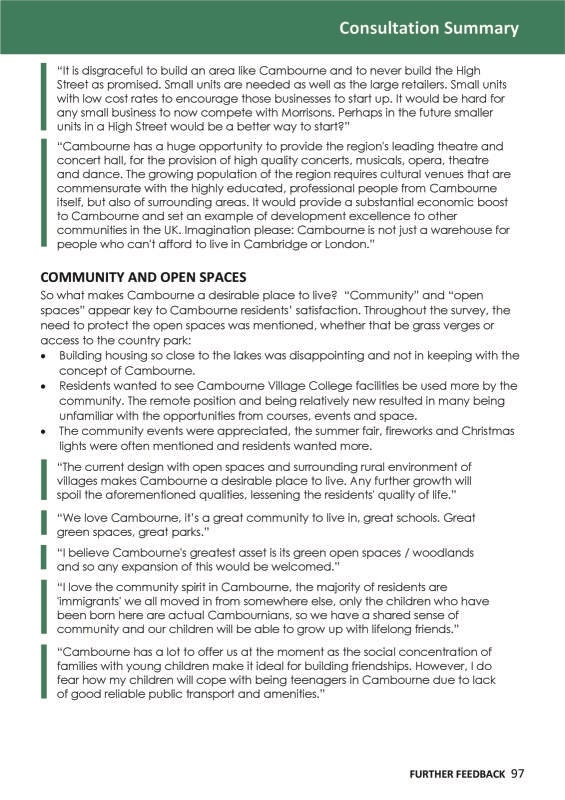 Only together can we make sure Cambourne remains a community we can continue to be proud of. 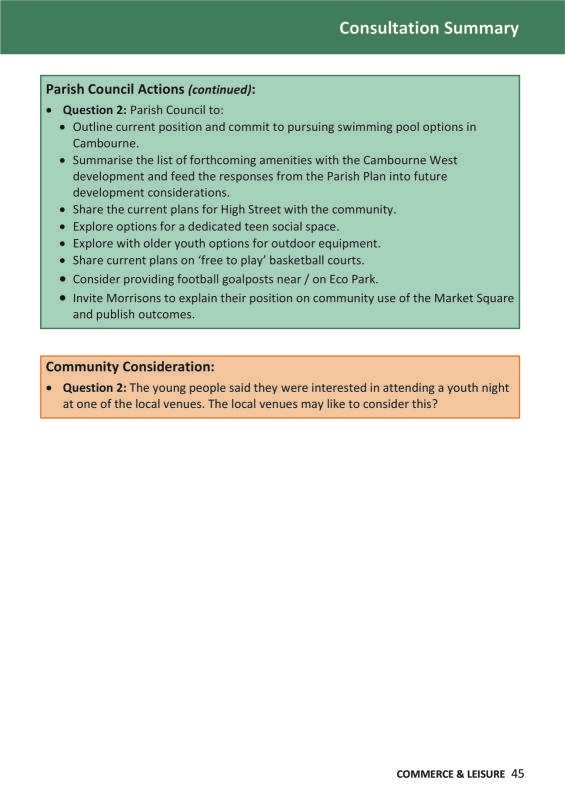 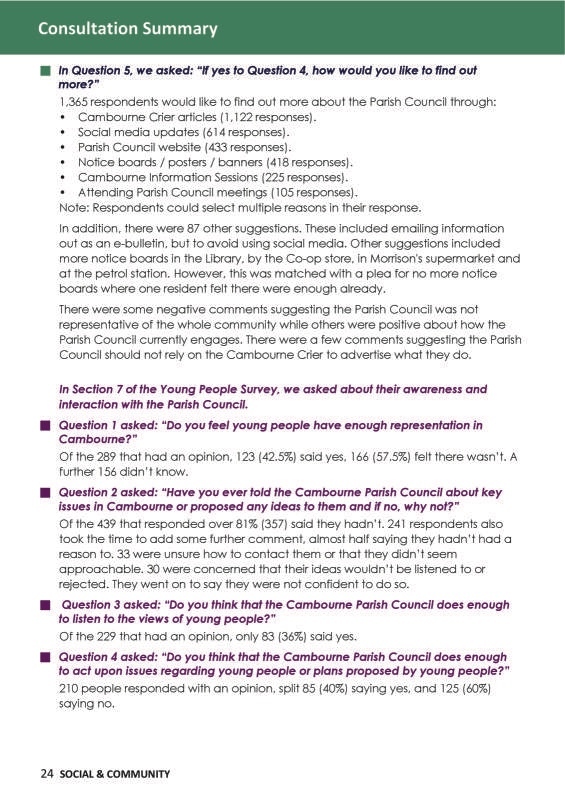 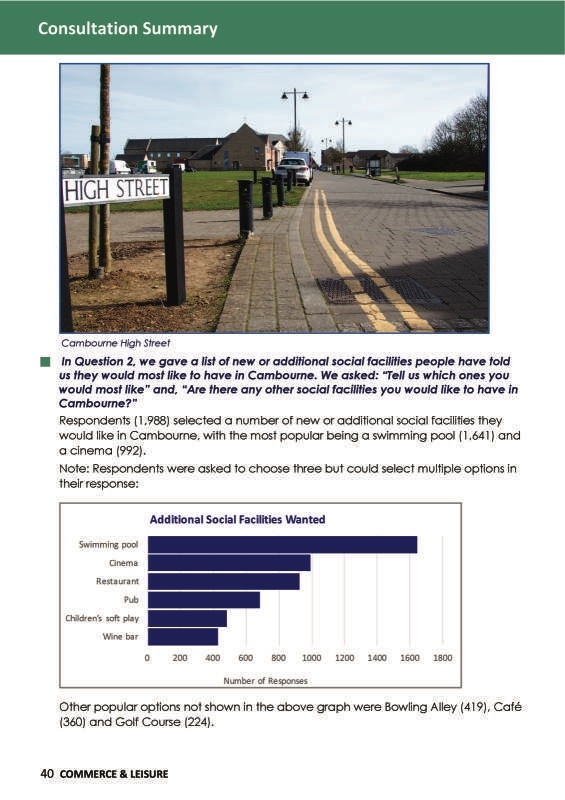 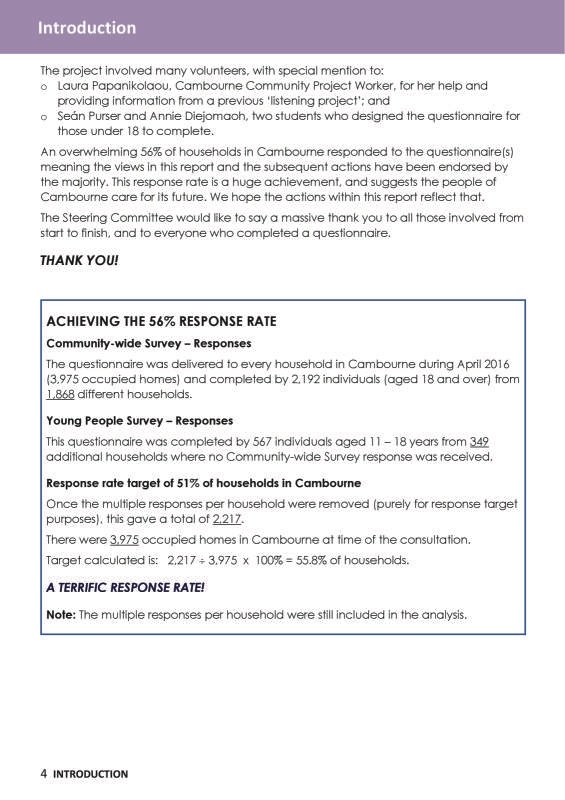 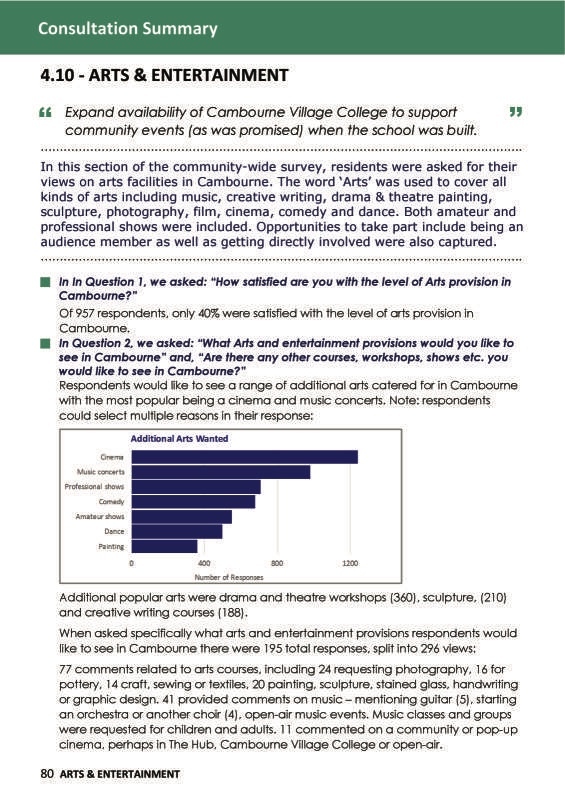 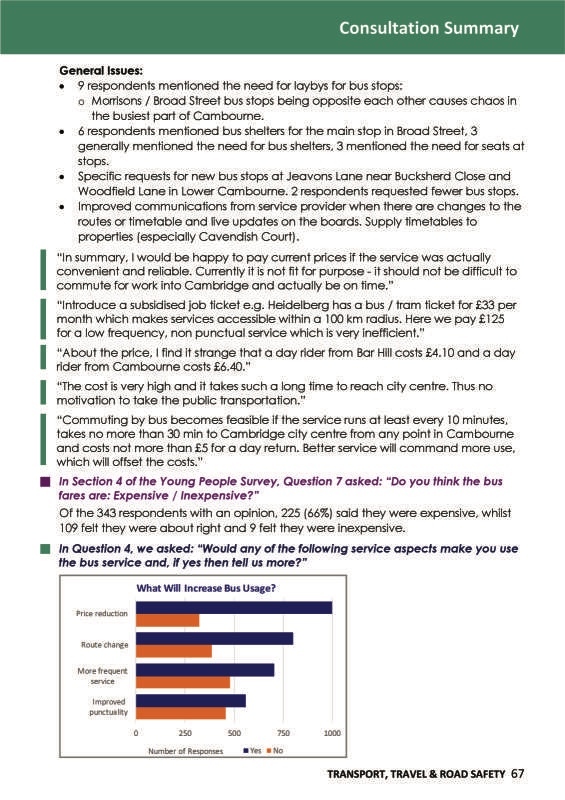 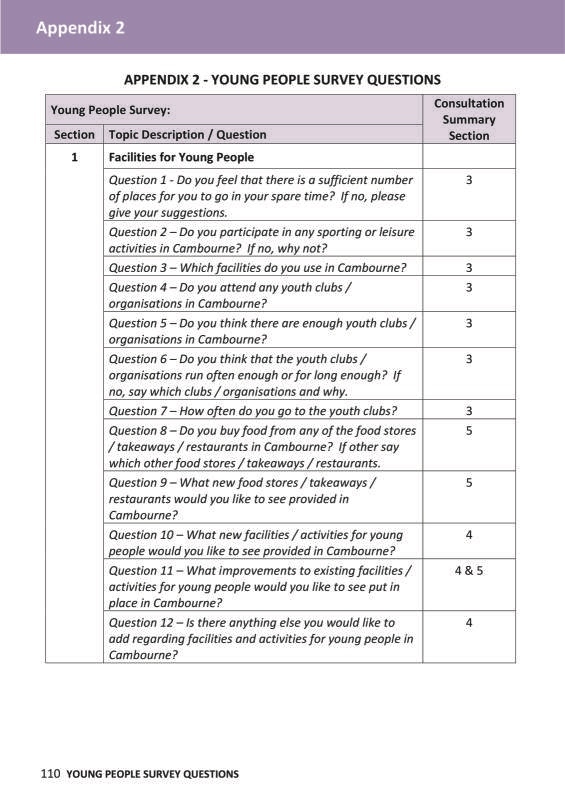 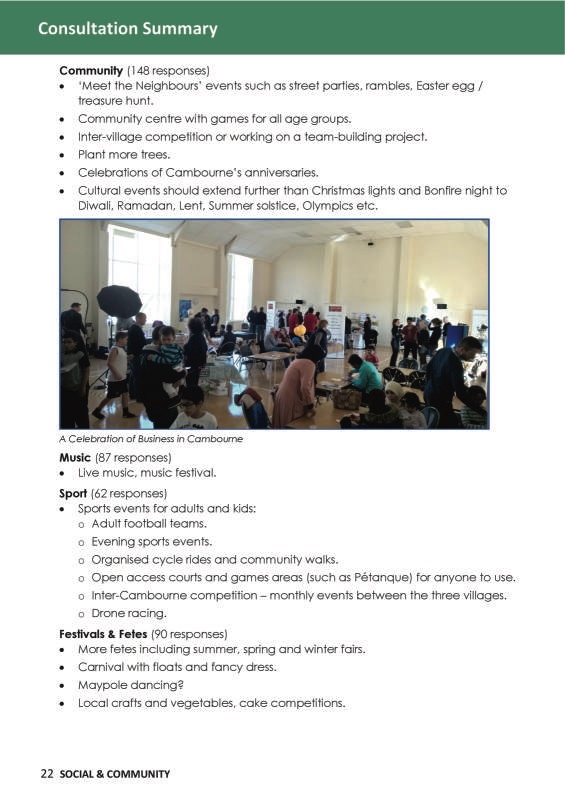 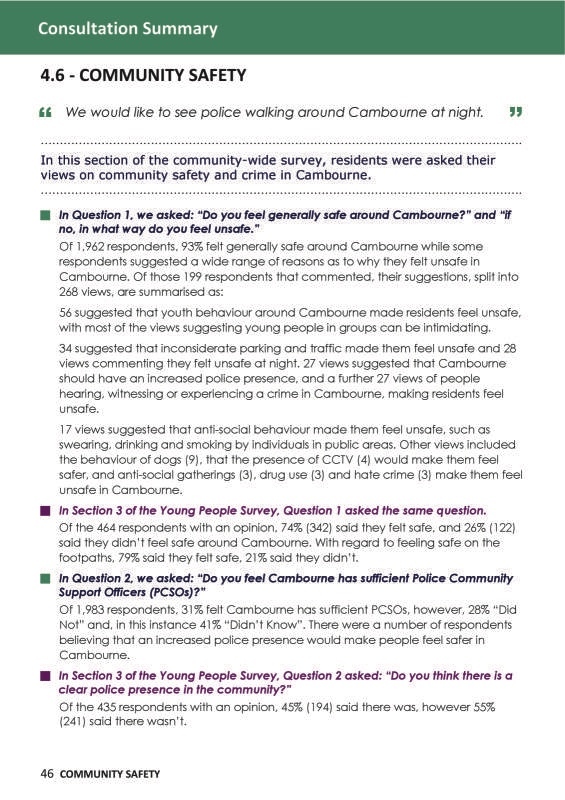 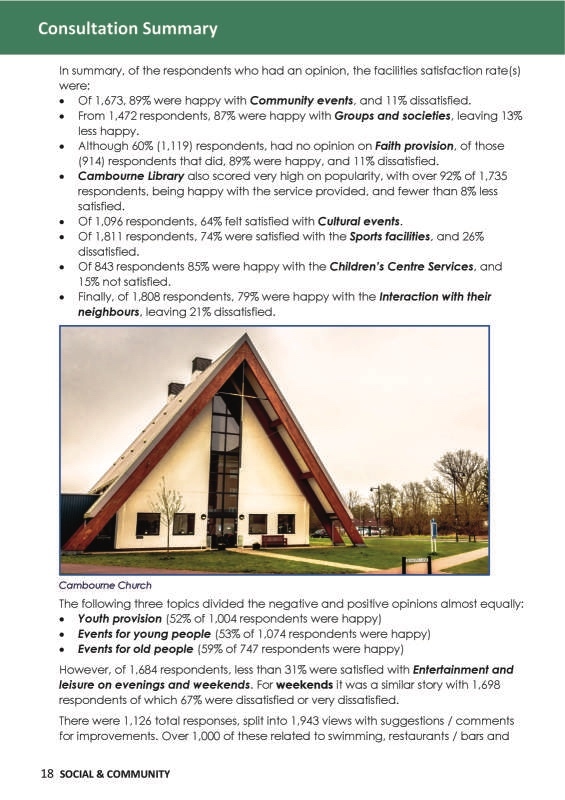 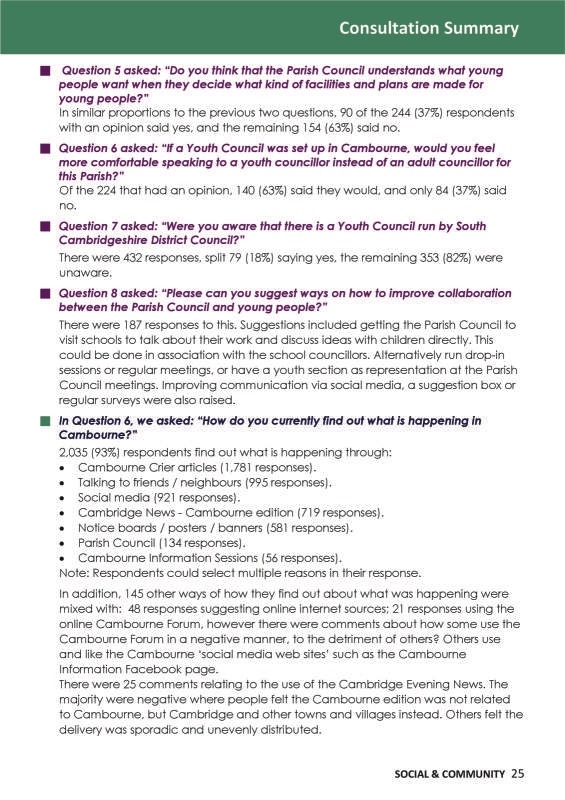 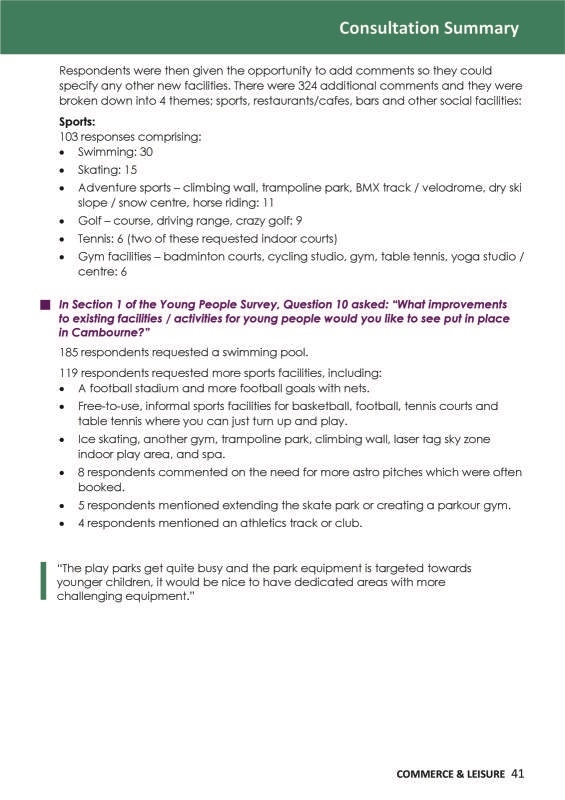 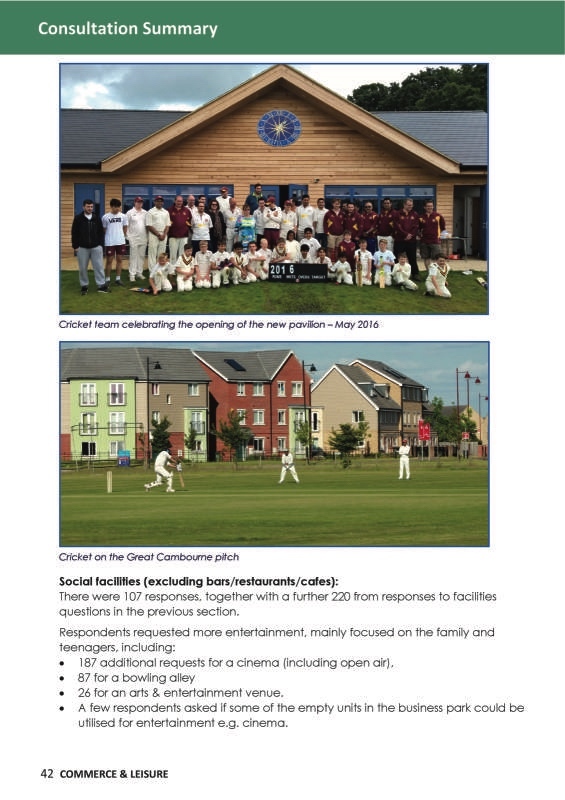 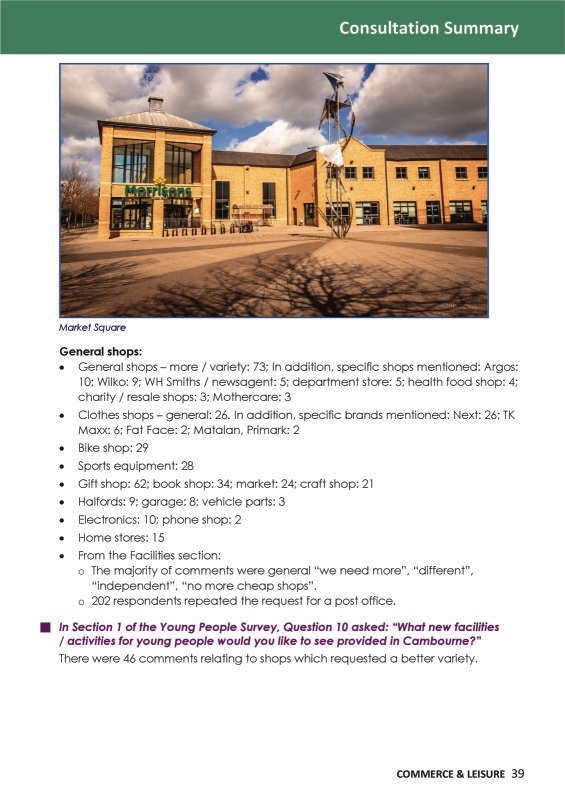 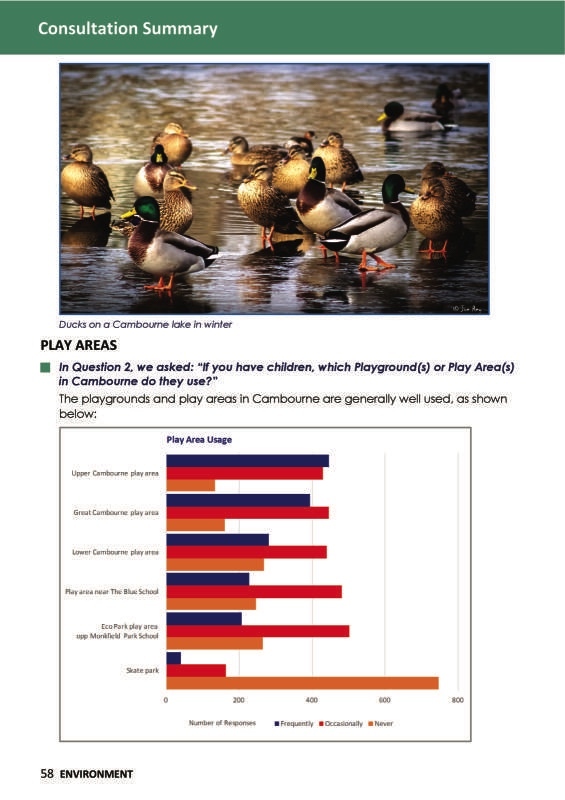 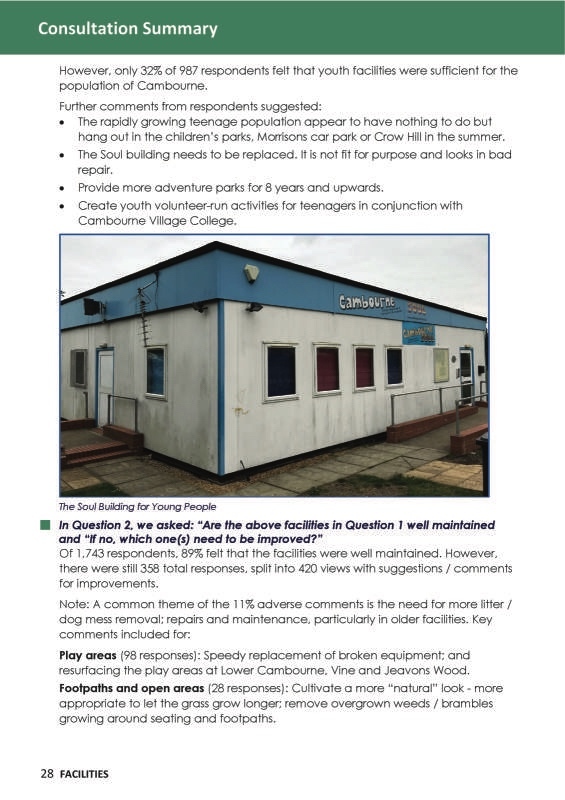 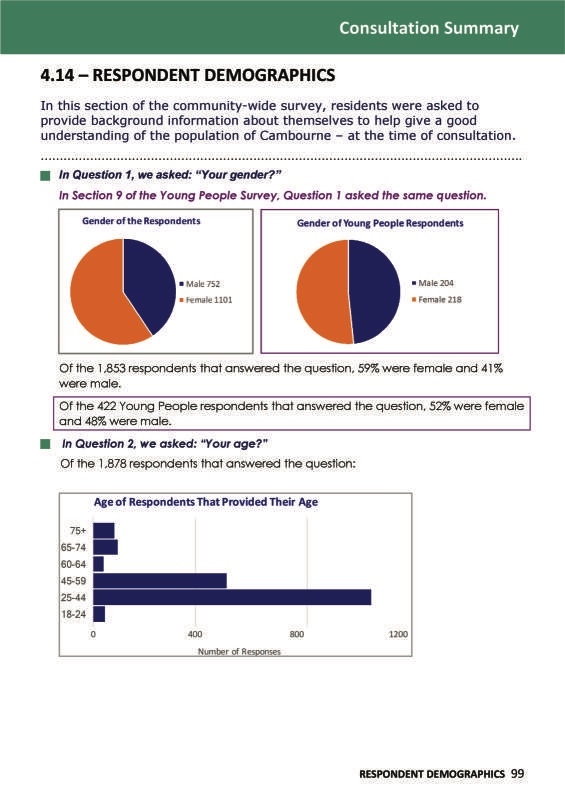 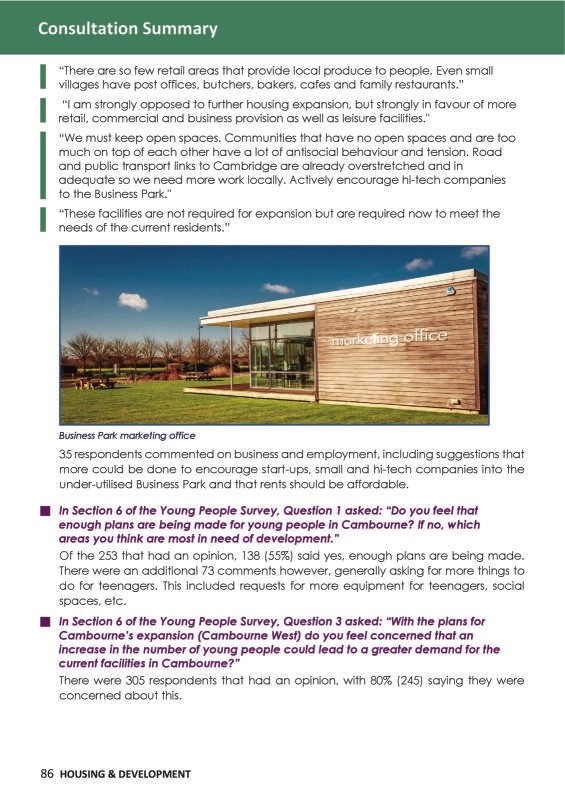 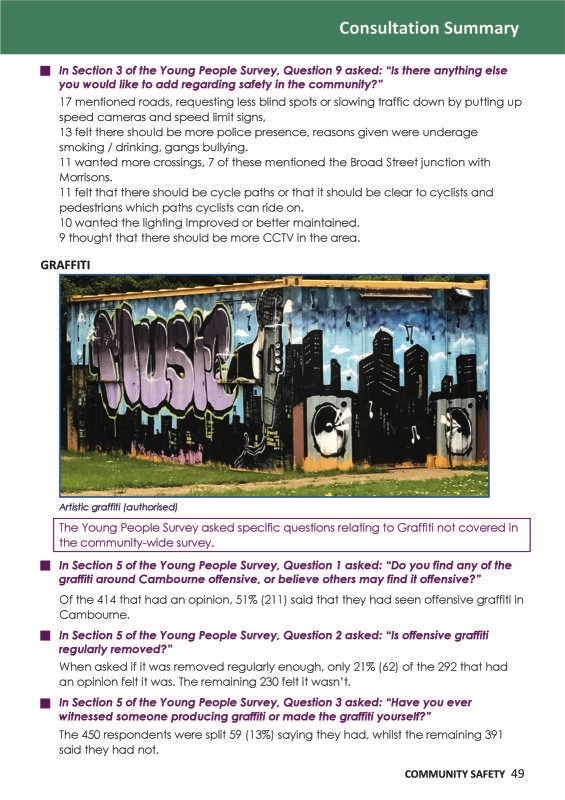 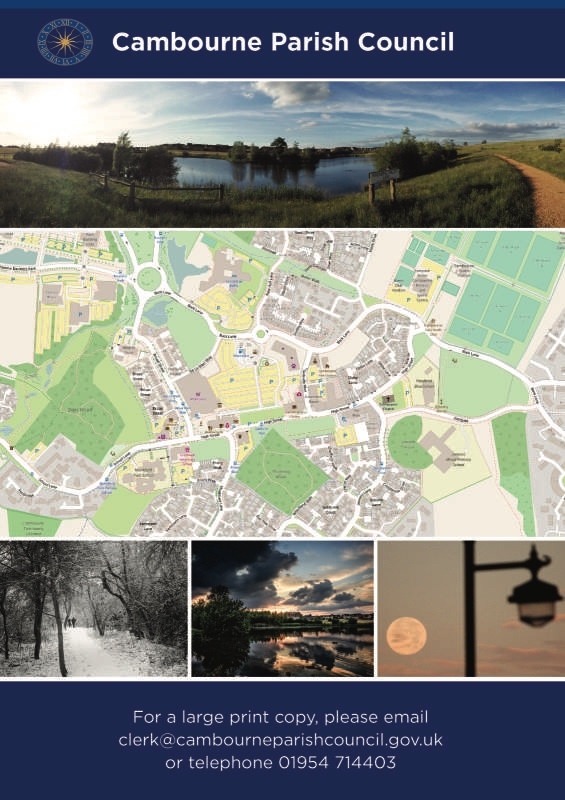 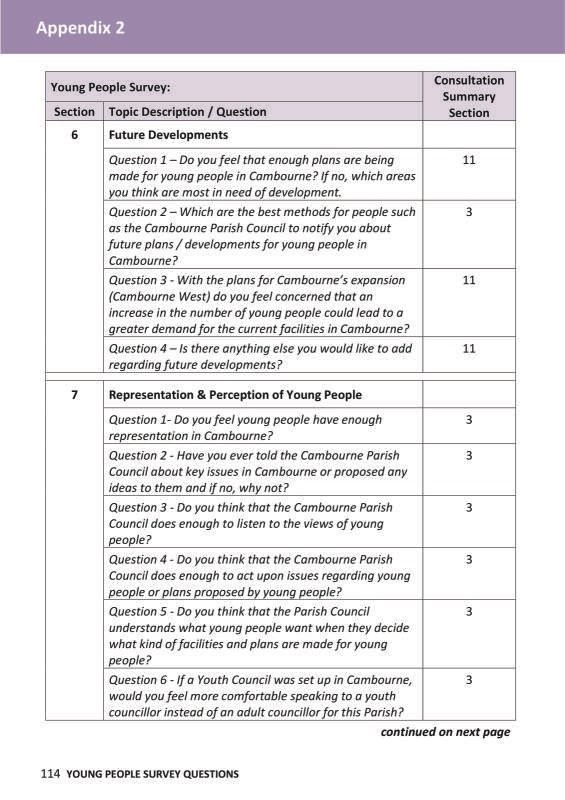 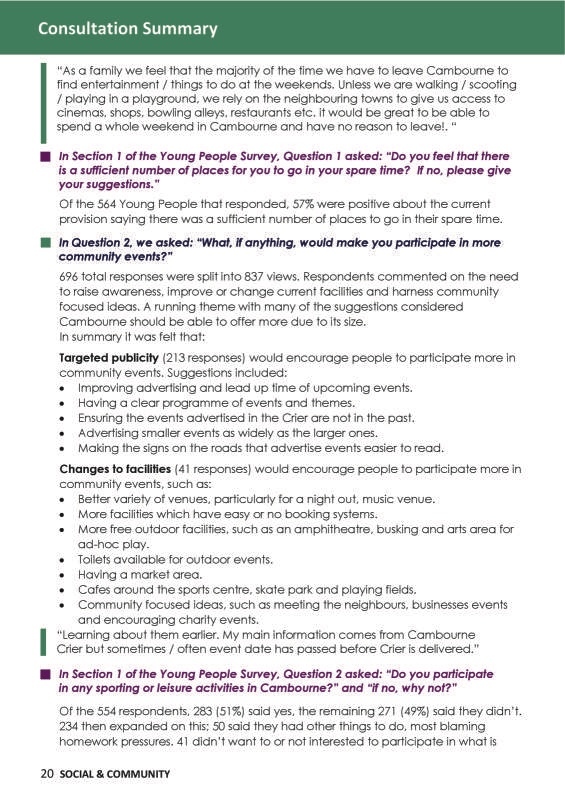 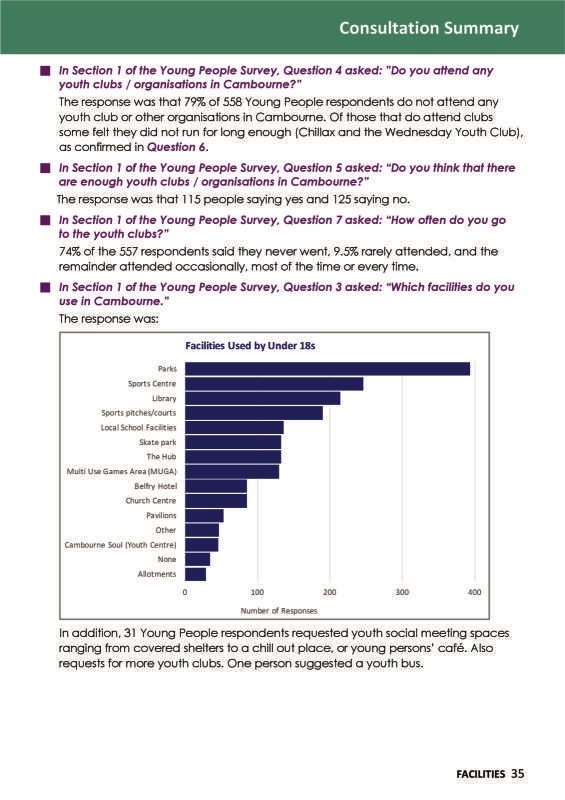 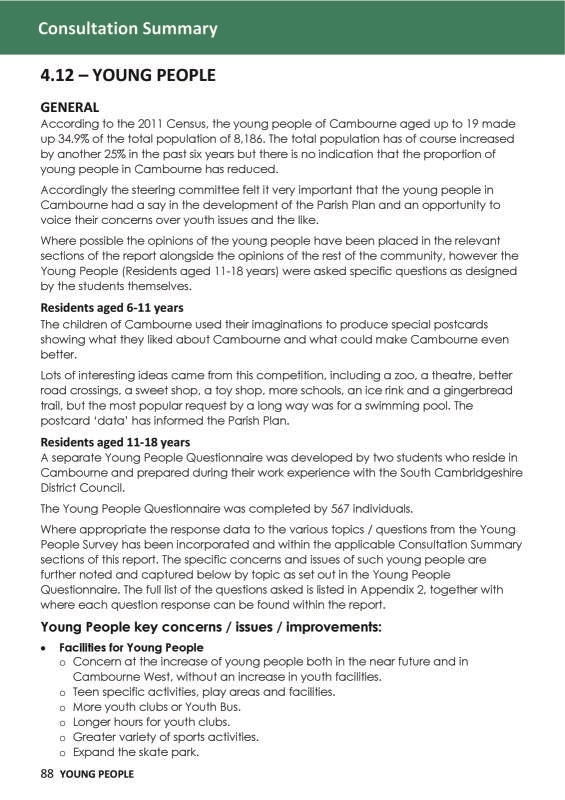 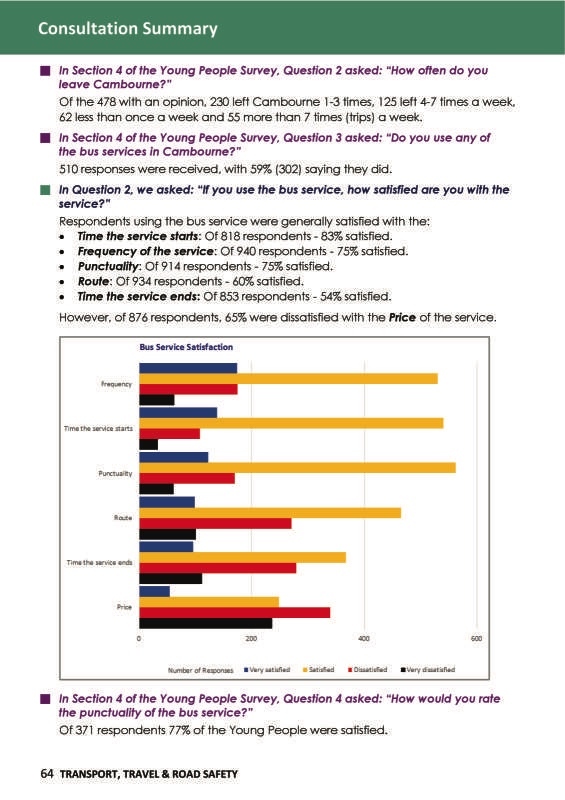 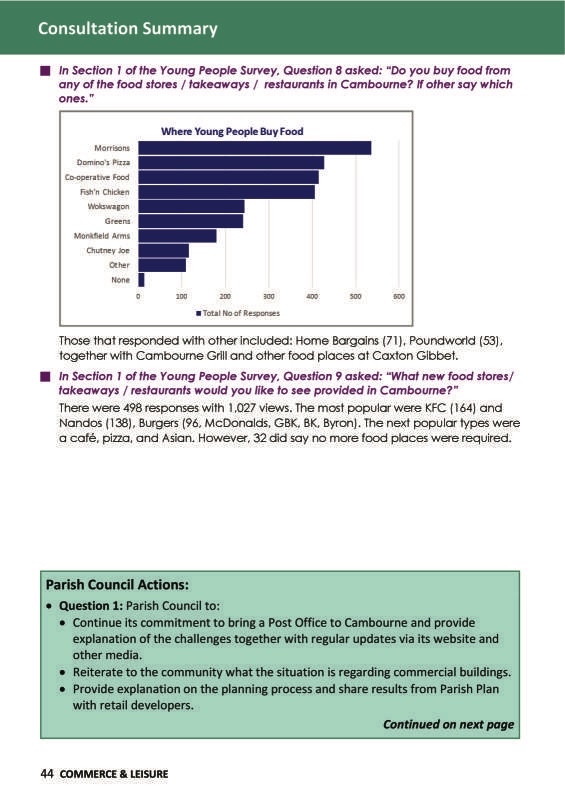 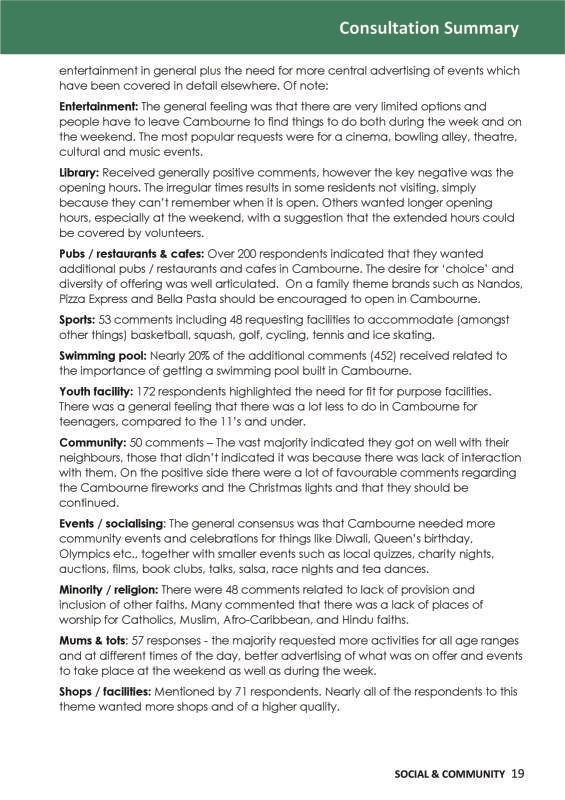 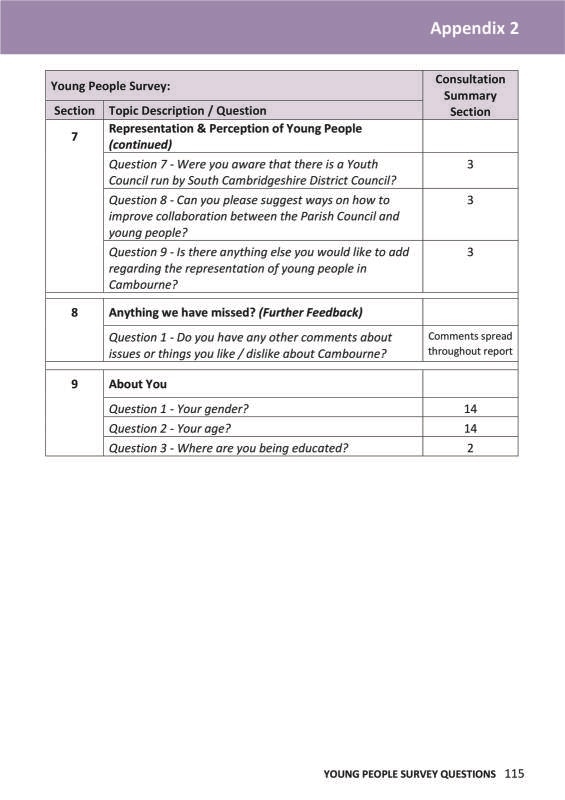 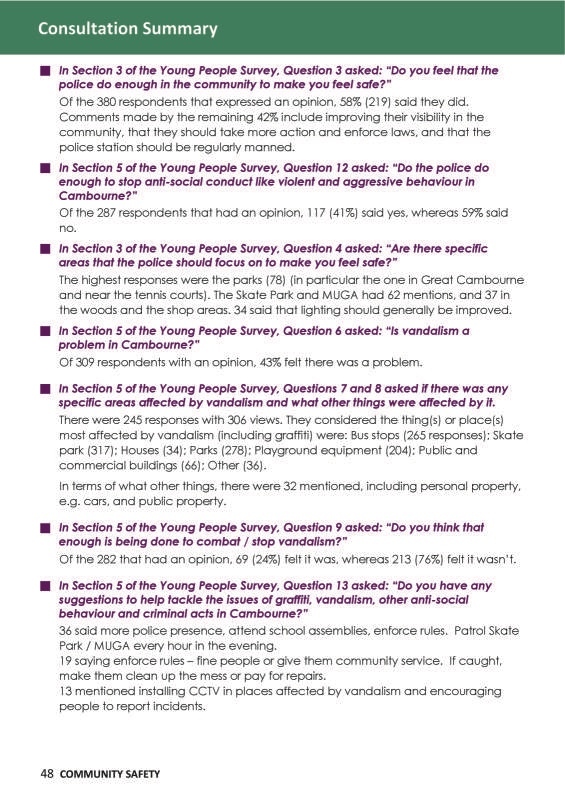 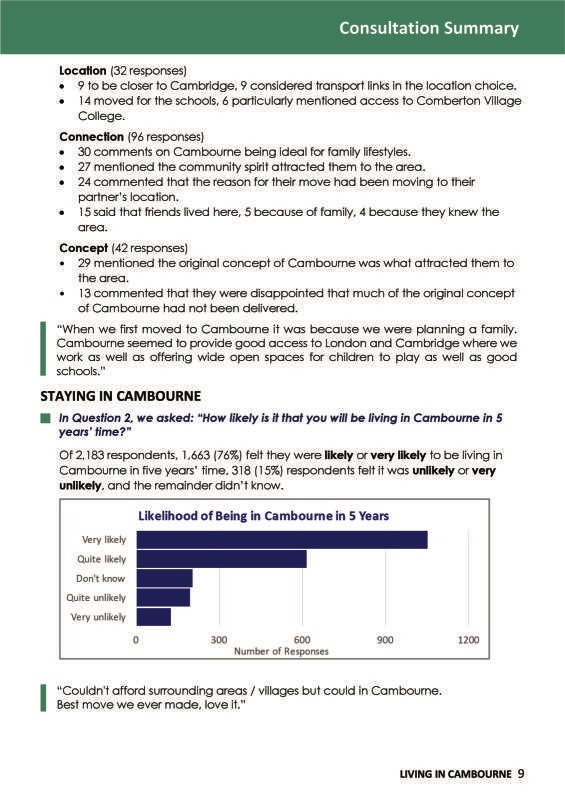 The responses and data from the Cambourne Parish Plan Community-wide Survey and the Young People Survey back in the summer of 2016 has been analysed and summarised into a Report (Parish Plan Summary Report). 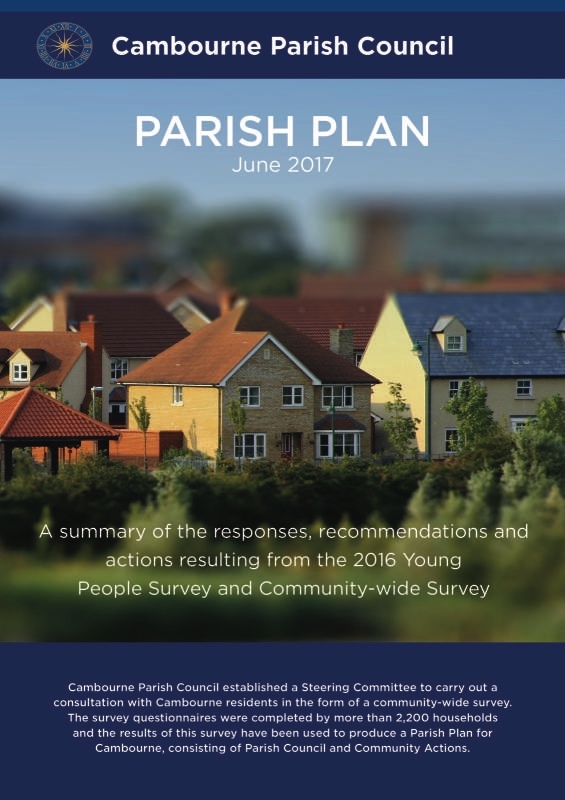 The survey findings and actions in the form of the Parish Plan Summary Report were presented to the Parish Councillors at a special meeting at the end of February 2017. 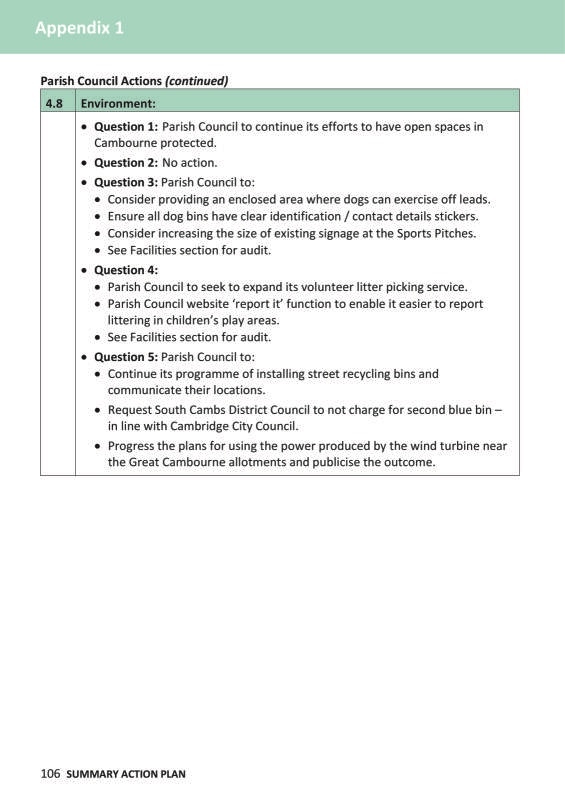 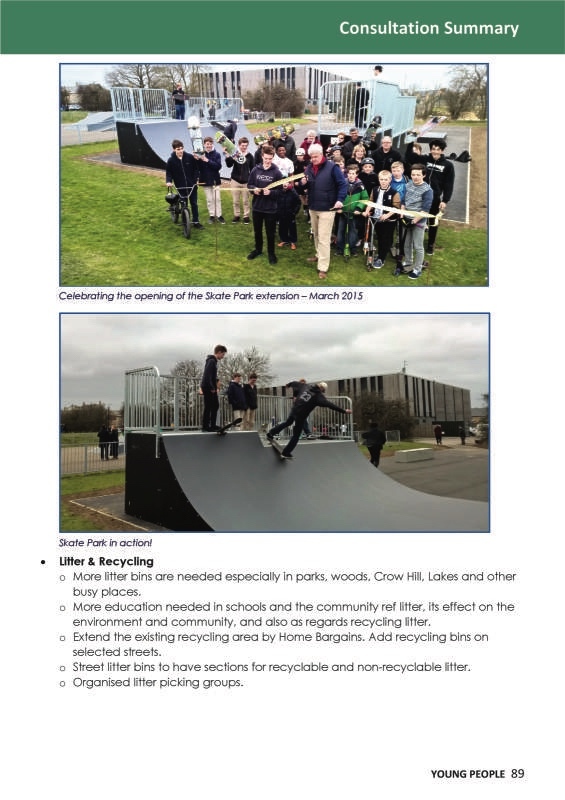 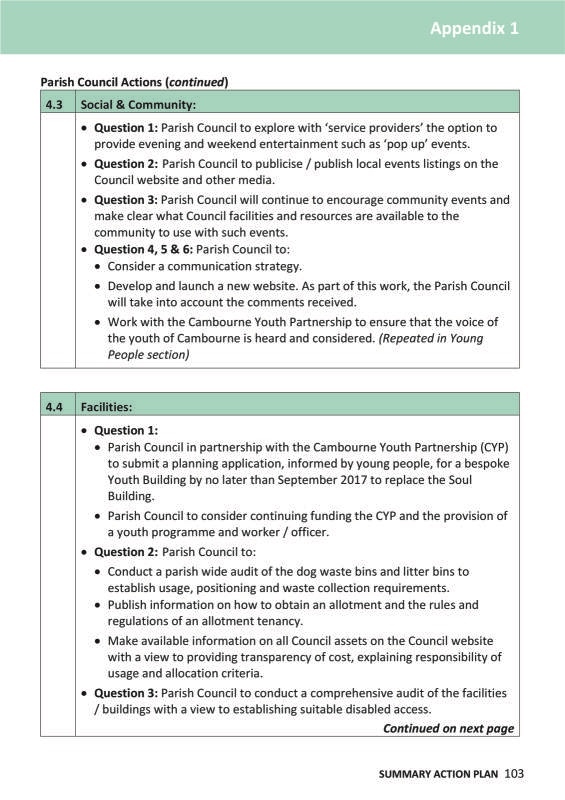 Following its adoption, the document was then finalised taking into consideration the Councillors comments and adopted actions and further presented to the Parish Council in May 2017 at which Council meeting the report was then endorsed by the Councillors. 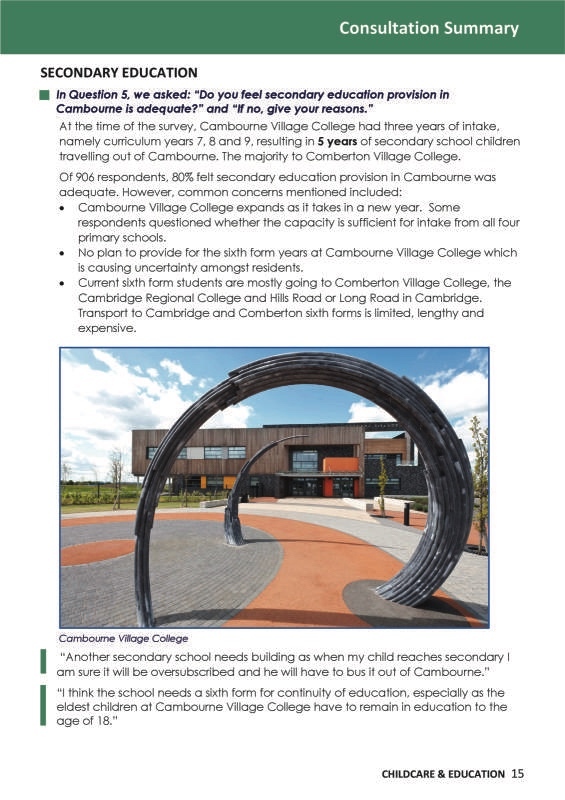 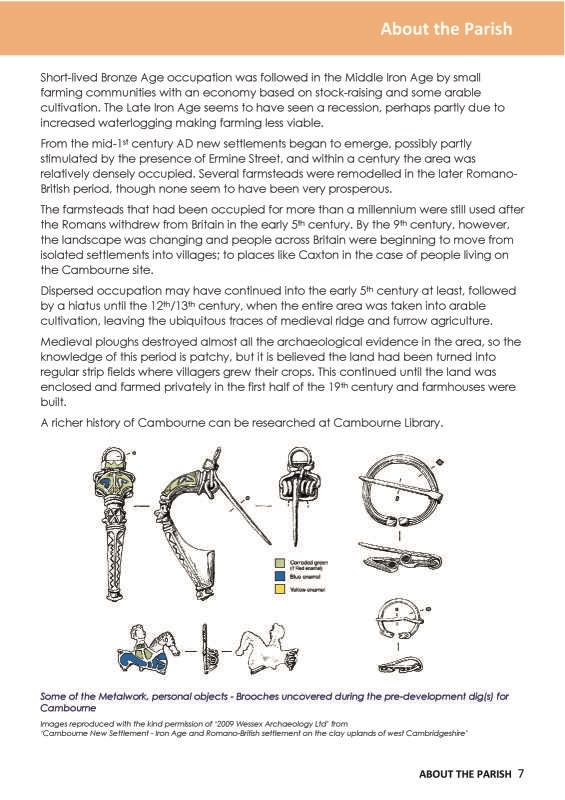 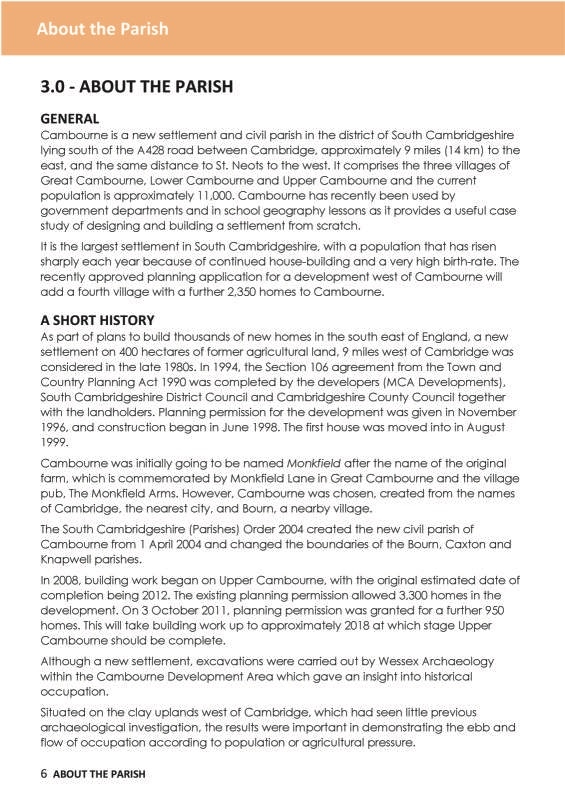 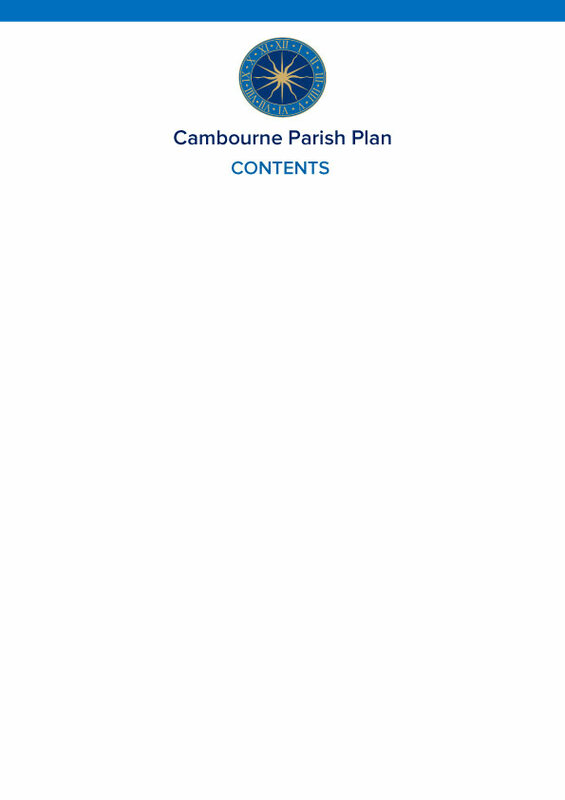 We are now able to share the final report with you all and this summary document is published as the “Cambourne Parish Plan”. 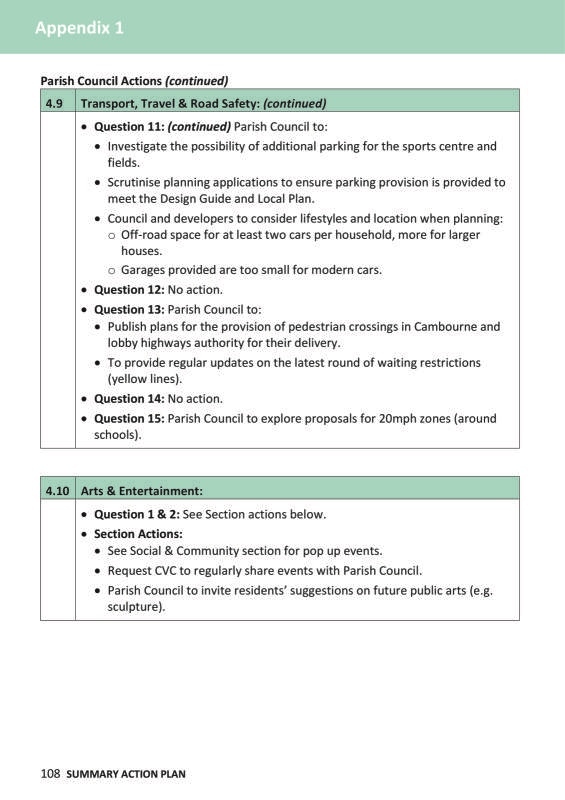 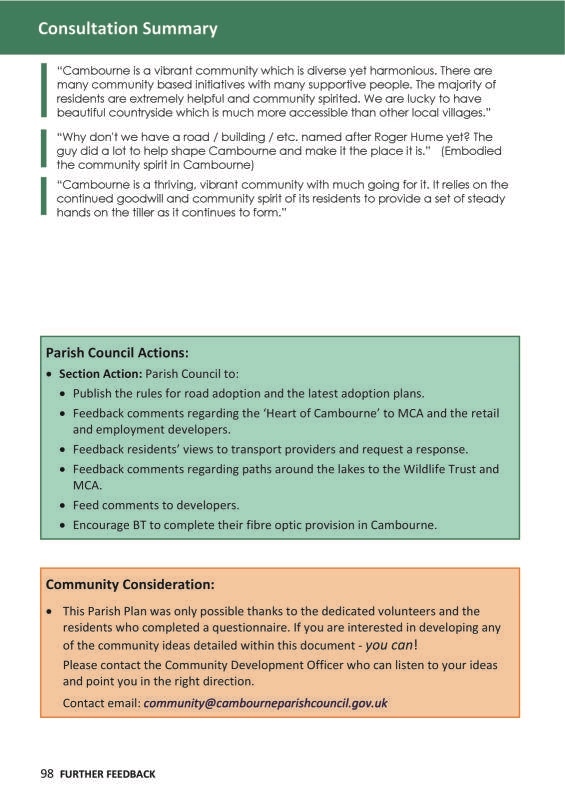 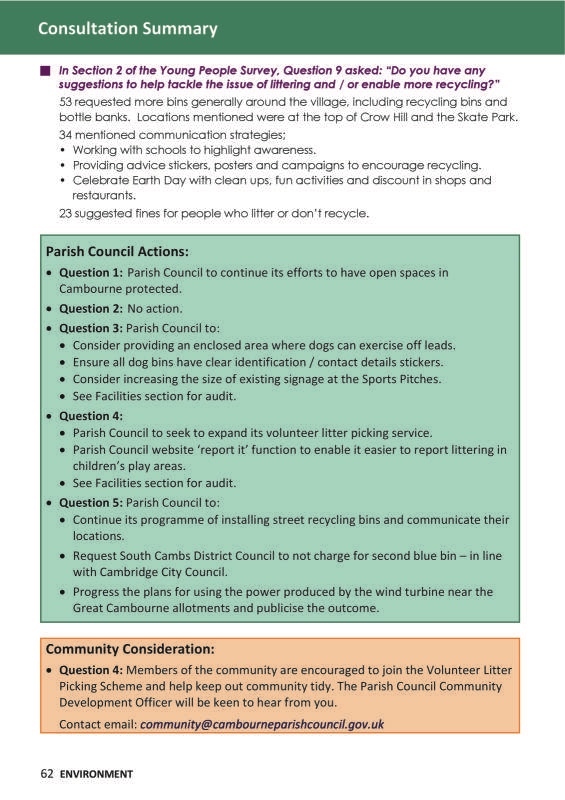 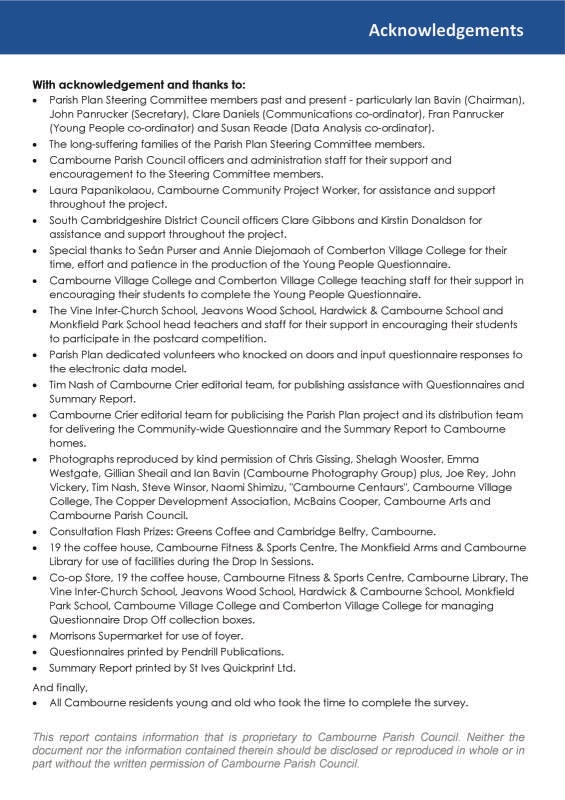 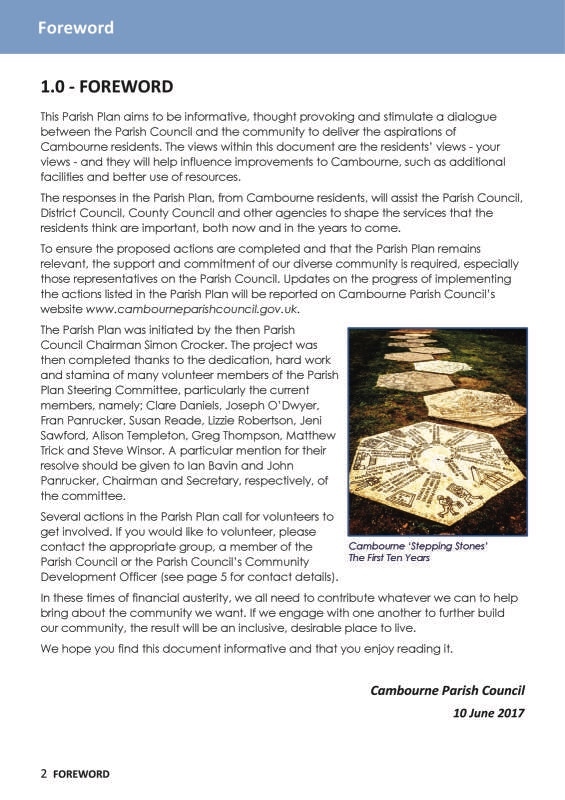 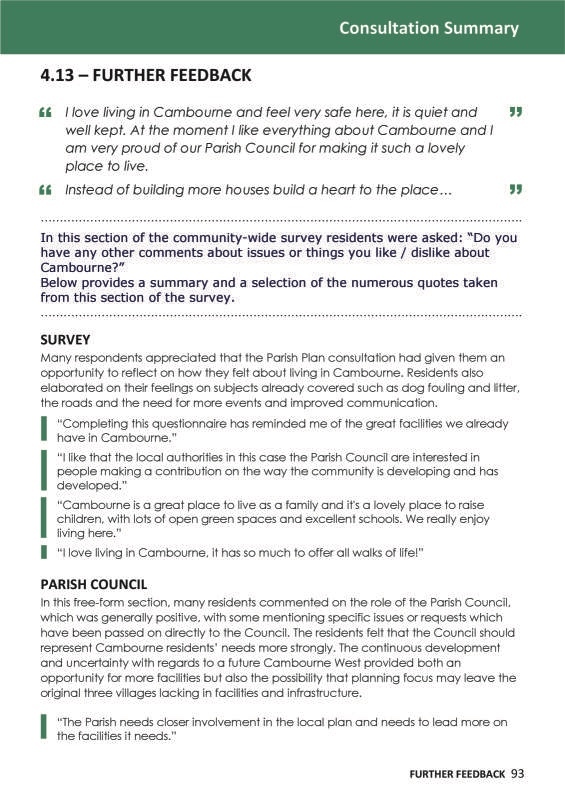 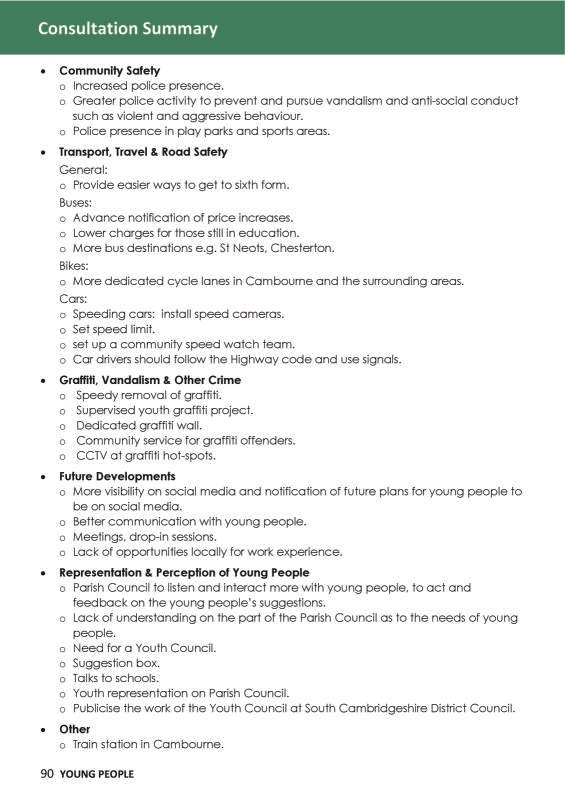 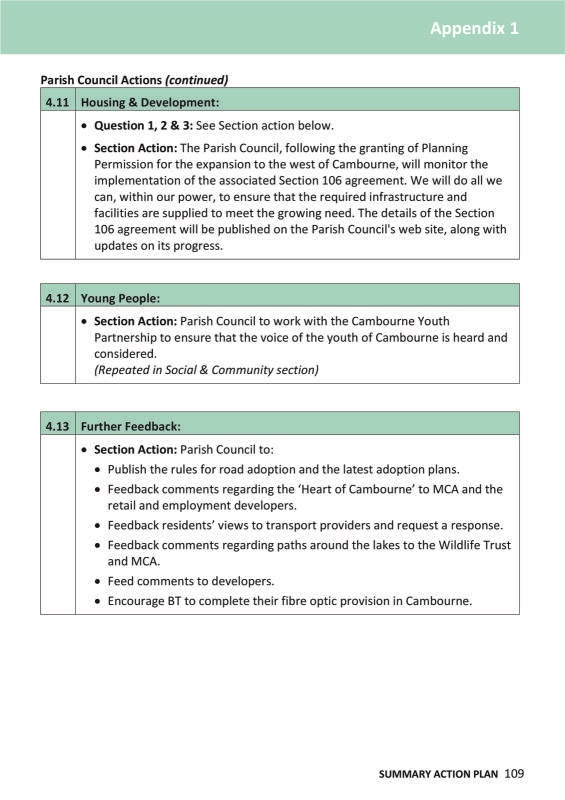 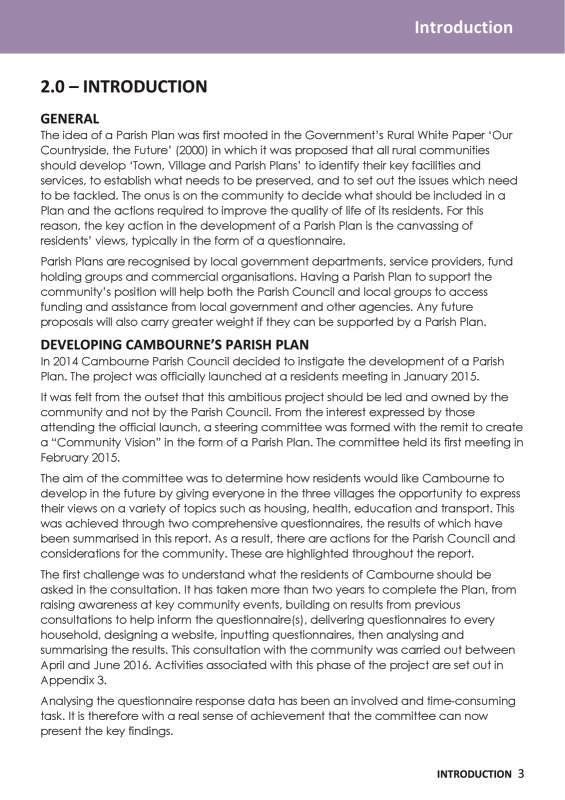 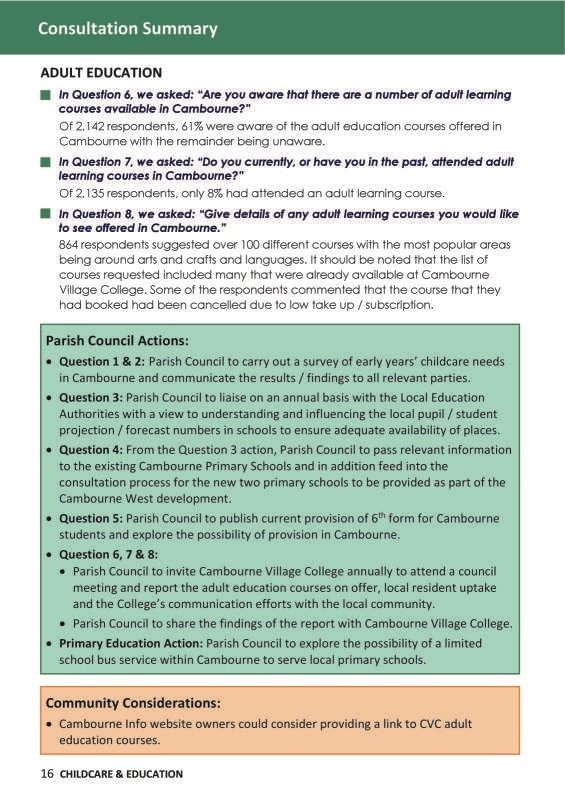 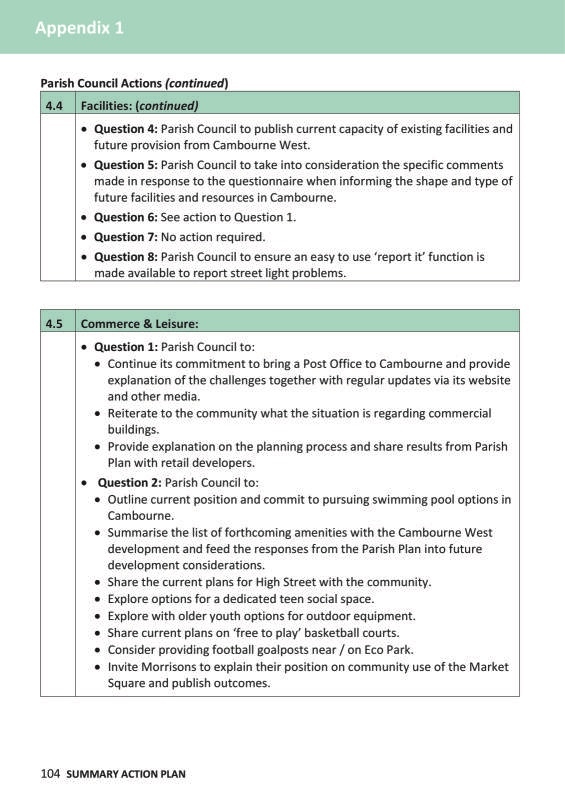 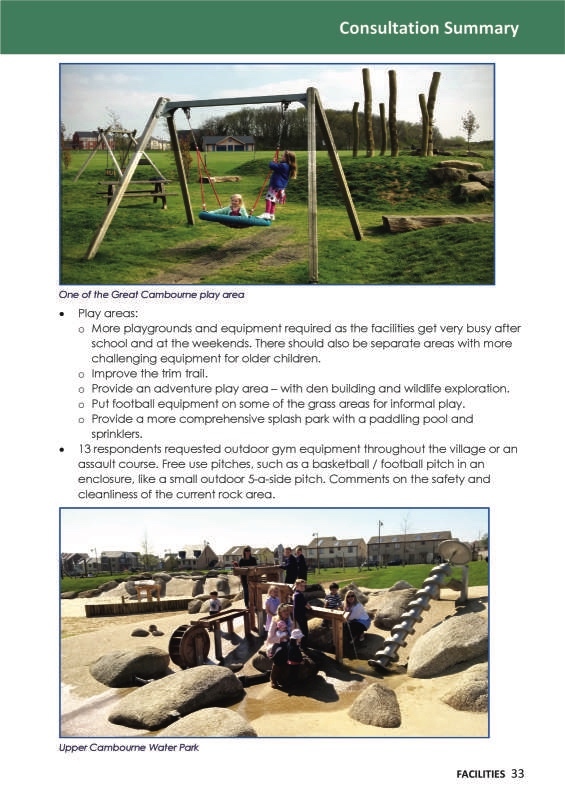 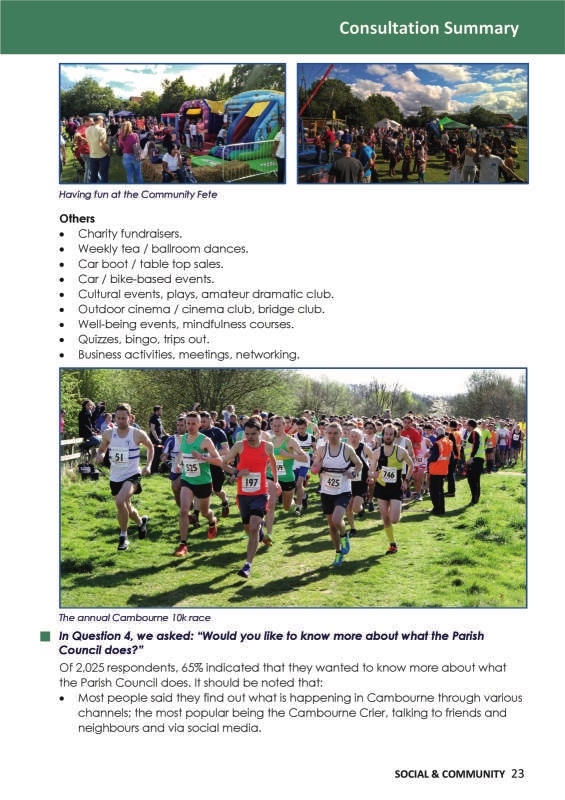 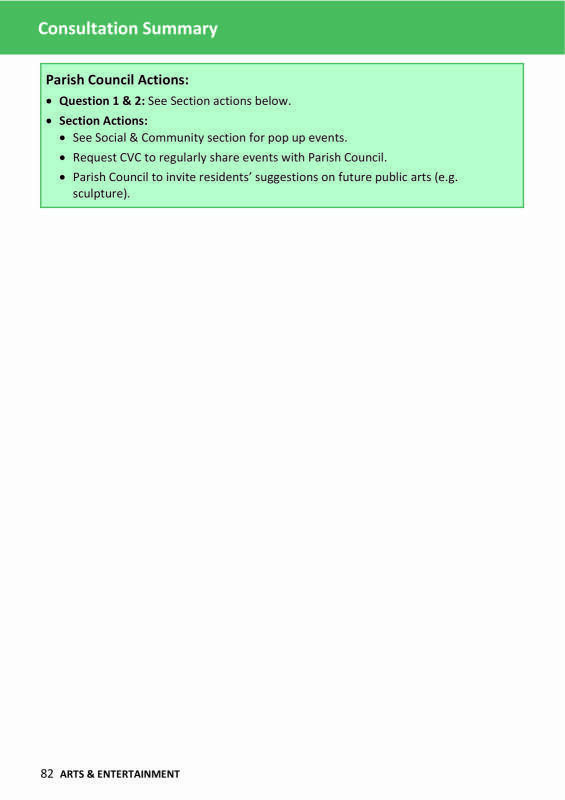 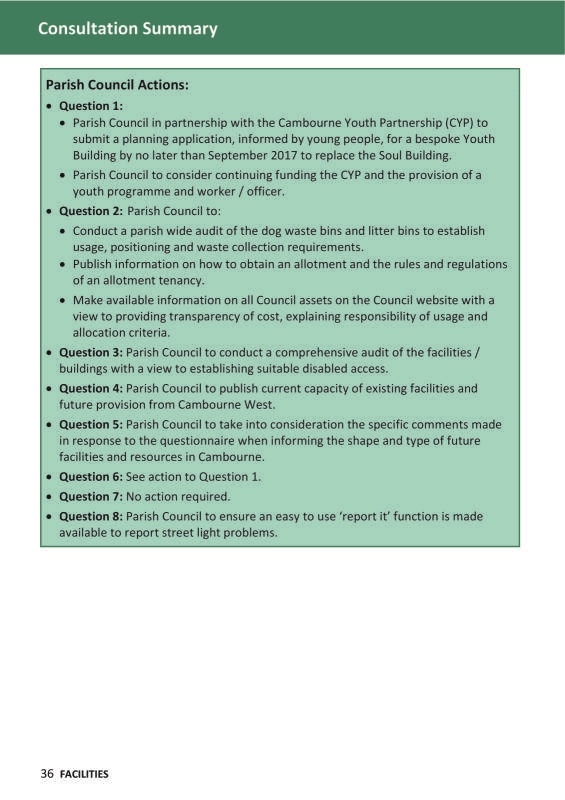 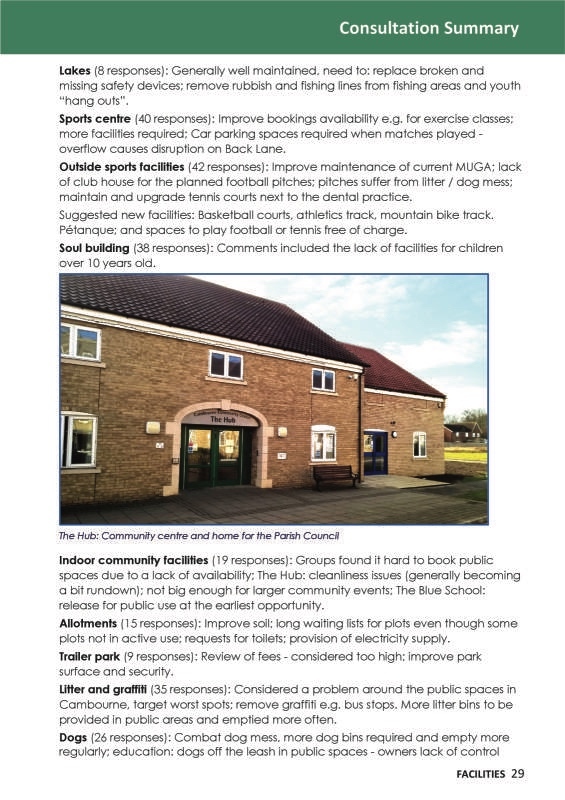 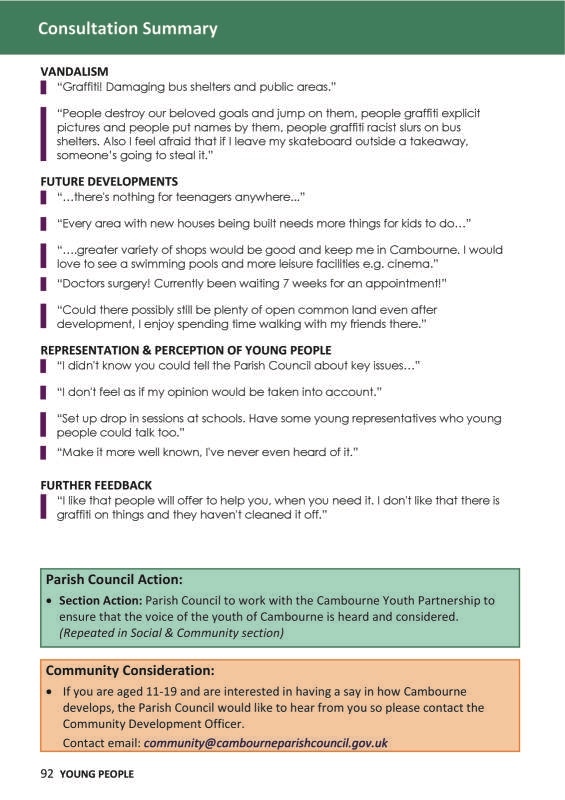 The “Cambourne Parish Plan” (Parish Plan Summary Report) covers amongst other things, what you the community have identified as being important to the ongoing development of Cambourne and sets out the actions adopted by the Parish Council that need to be taken in order to achieve the community’s vision. 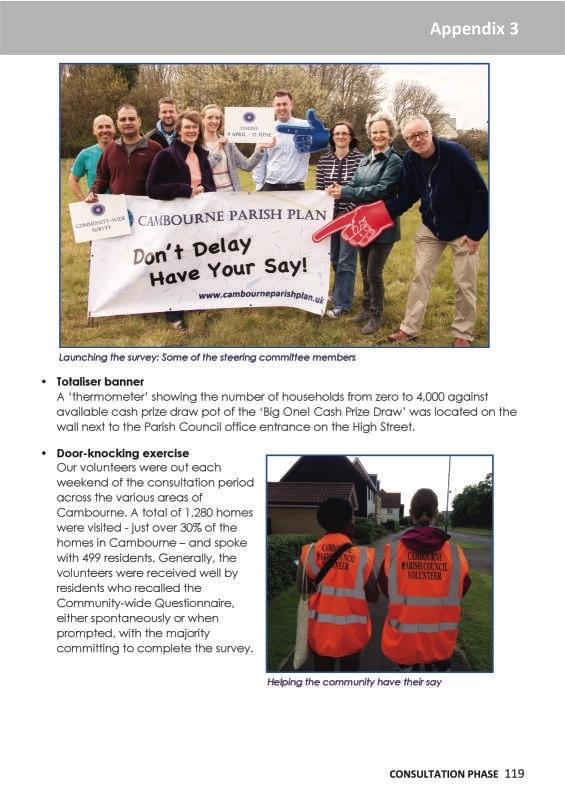 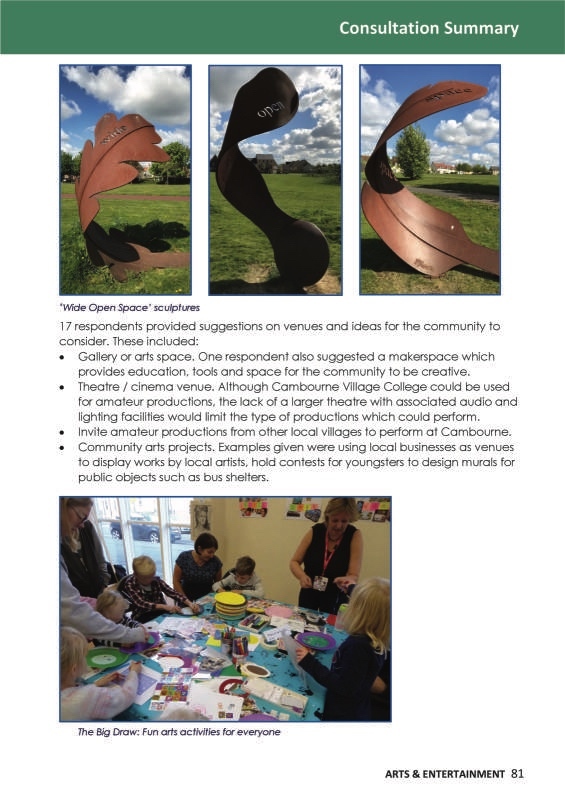 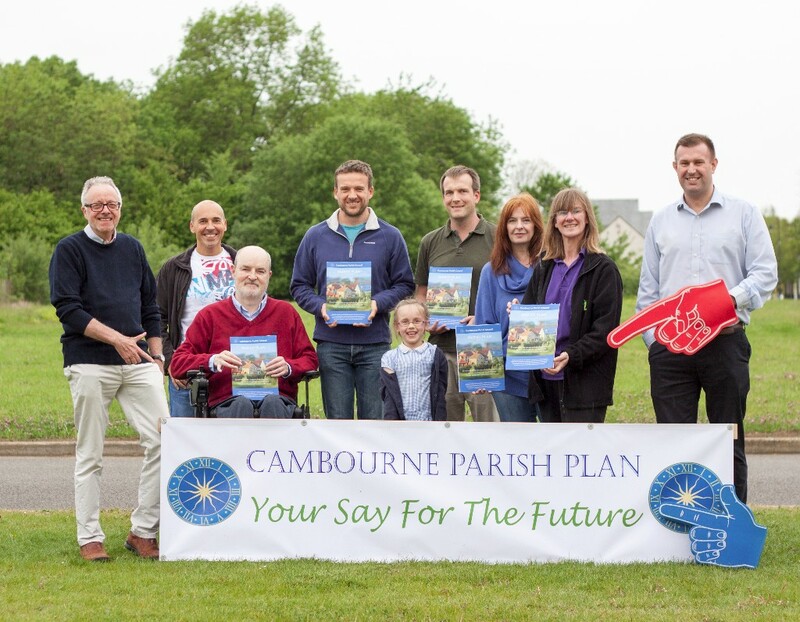 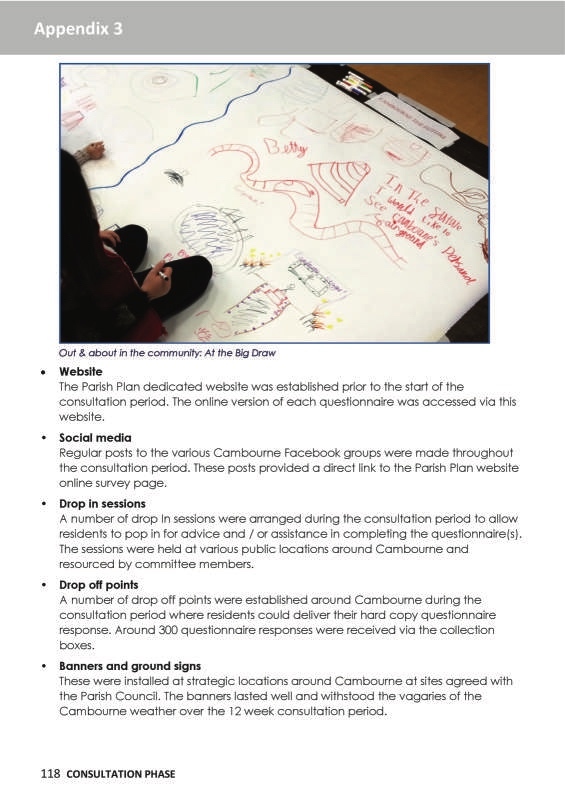 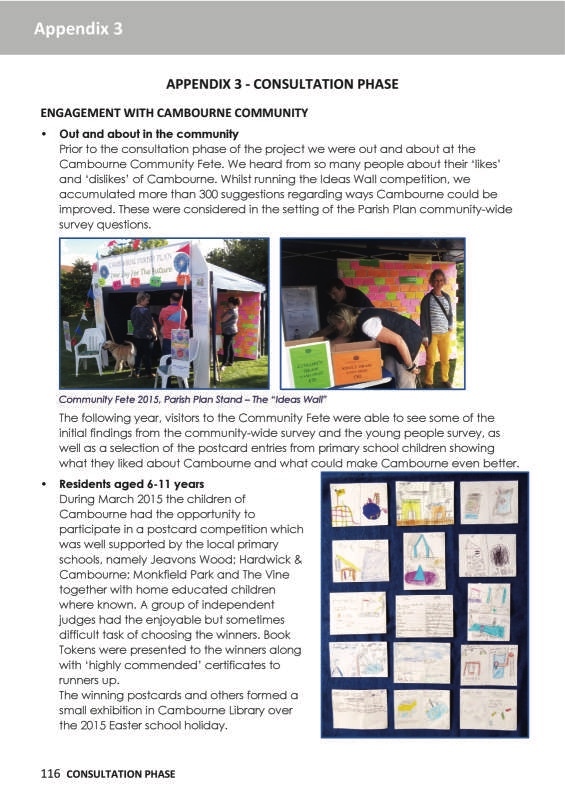 The “Cambourne Parish Plan” was printed and published during June 2017, with the official Launch event on 10 June 2017. 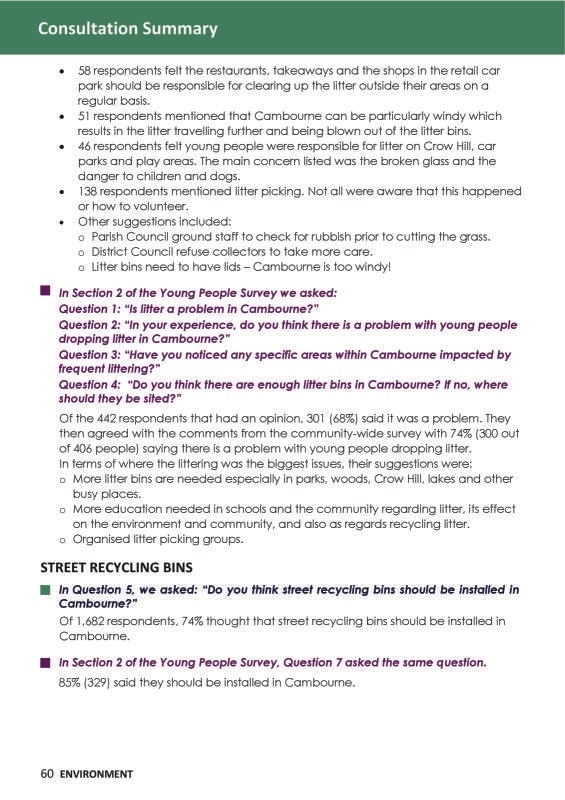 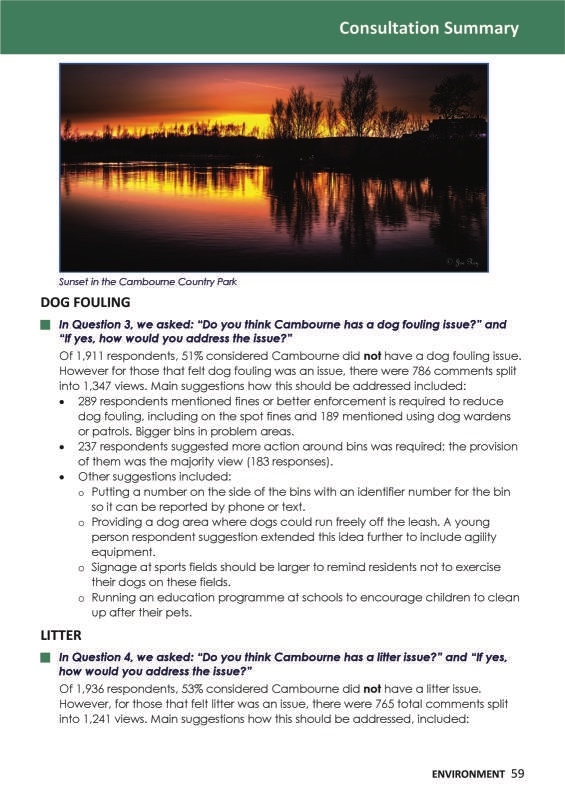 It is the intention of the Parish Council that a printed copy will be delivered “through every letter box” in Cambourne. 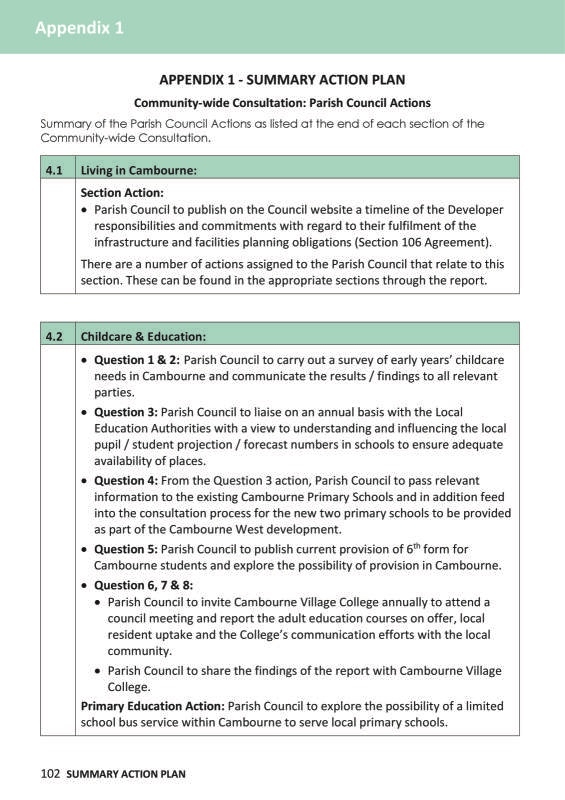 At the request of the Parish Council, a copy of the Summary Report will be delivered to every household in Cambourne. 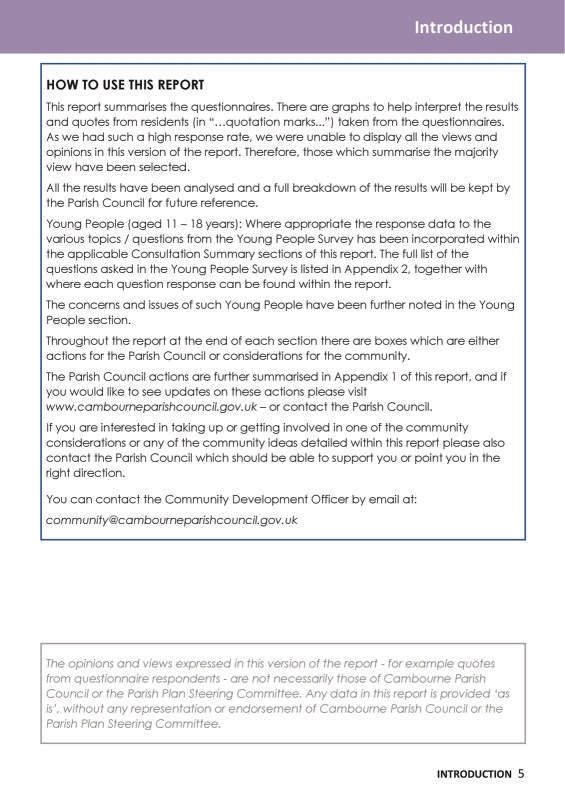 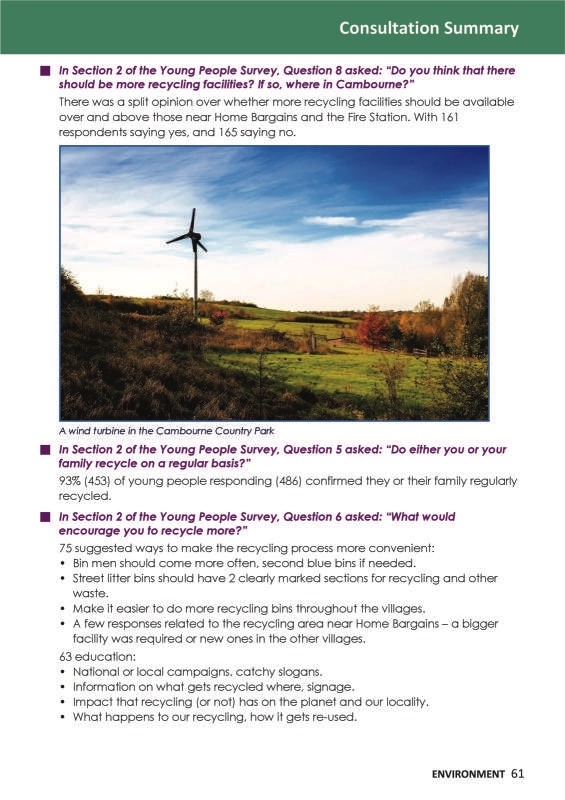 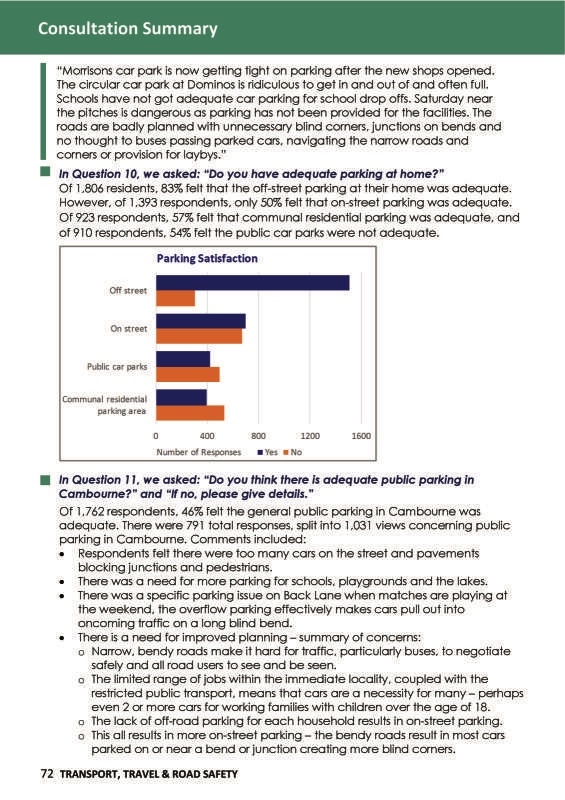 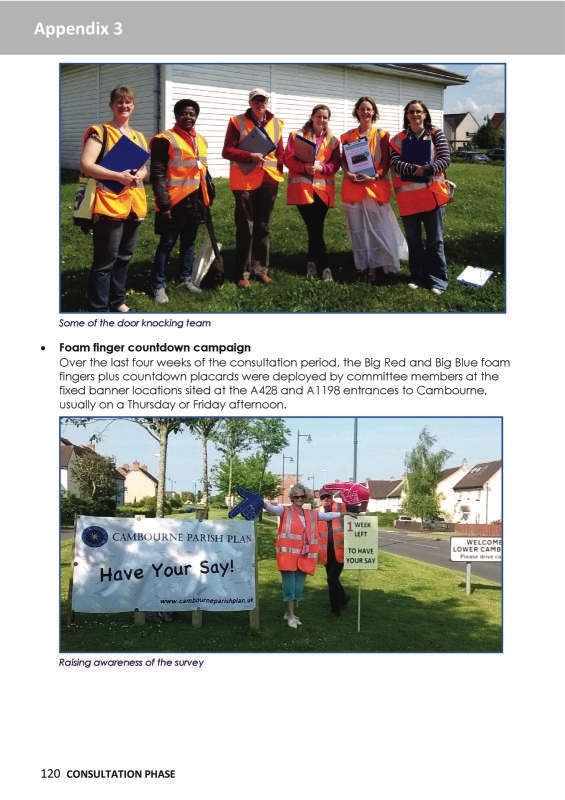 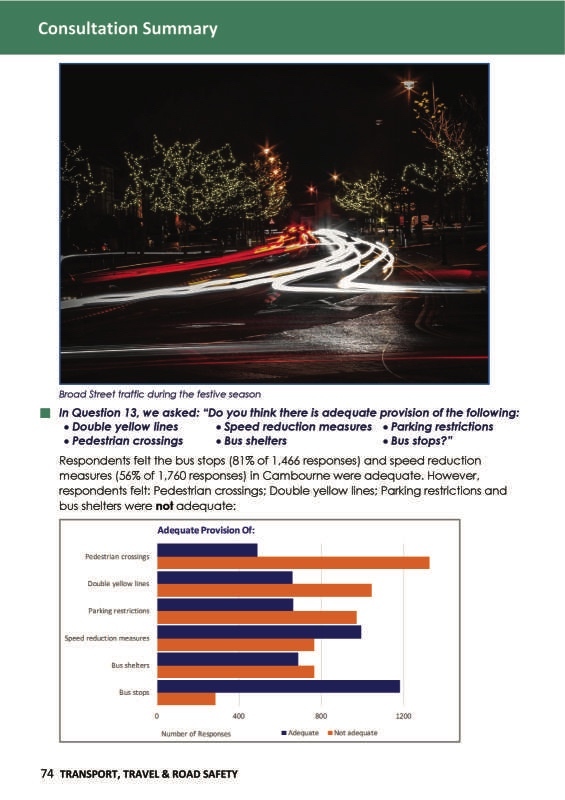 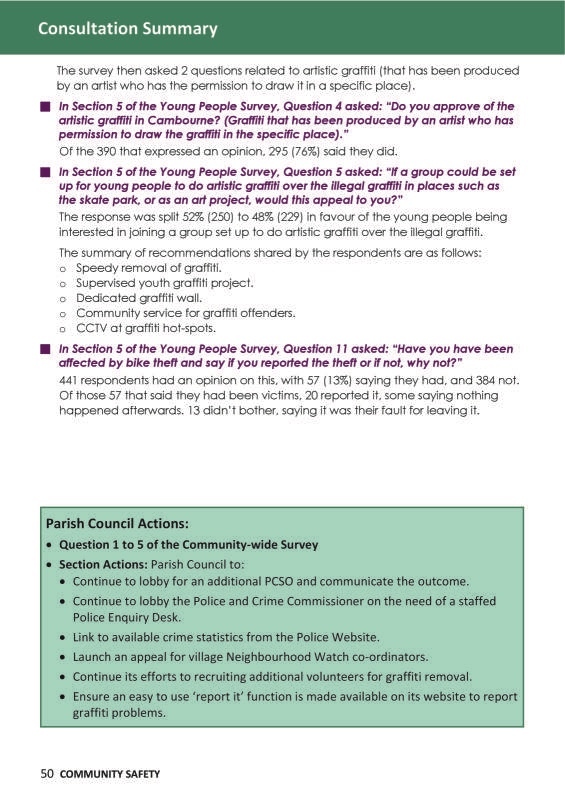 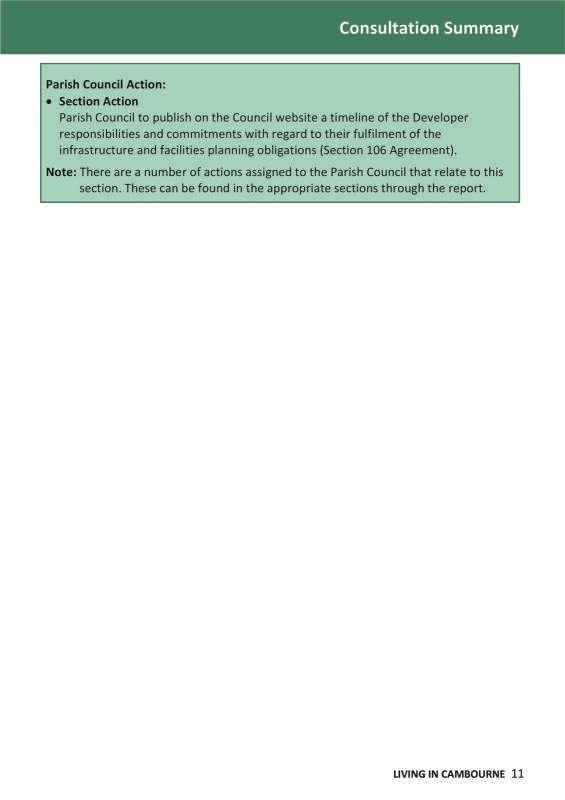 If you are one of the 56% of households that responded to the questionnaires last summer you will see that your thoughts and opinions have helped to shape the actions contained within the report that the Parish Council have adopted. 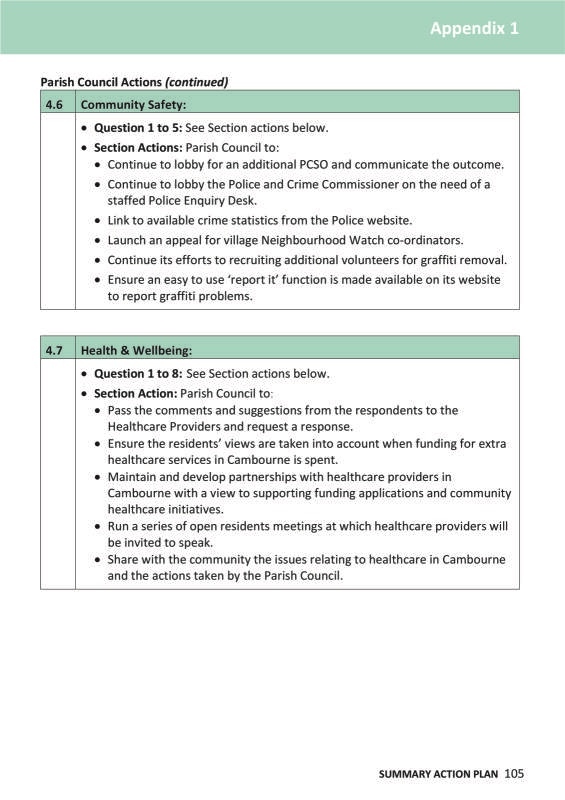 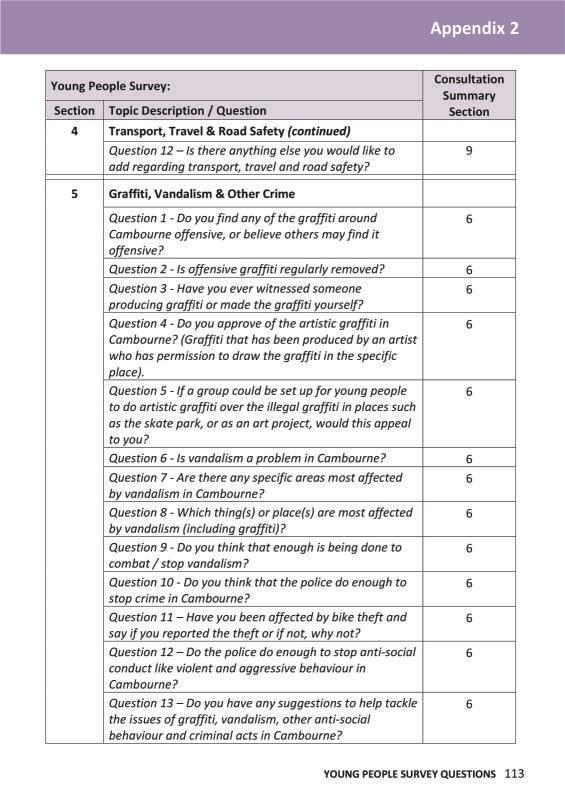 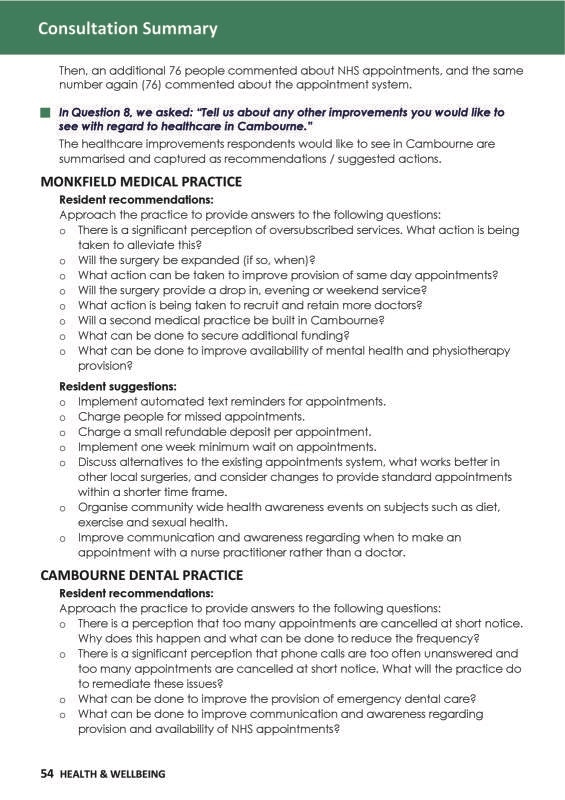 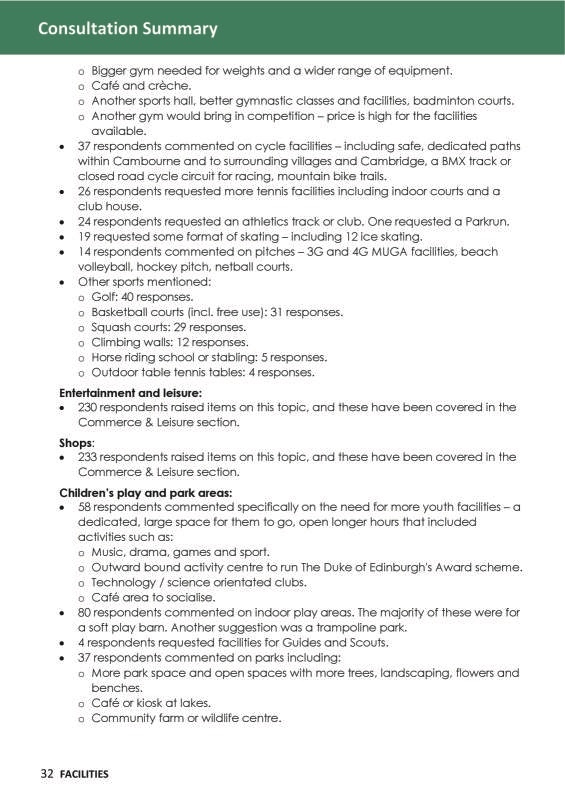 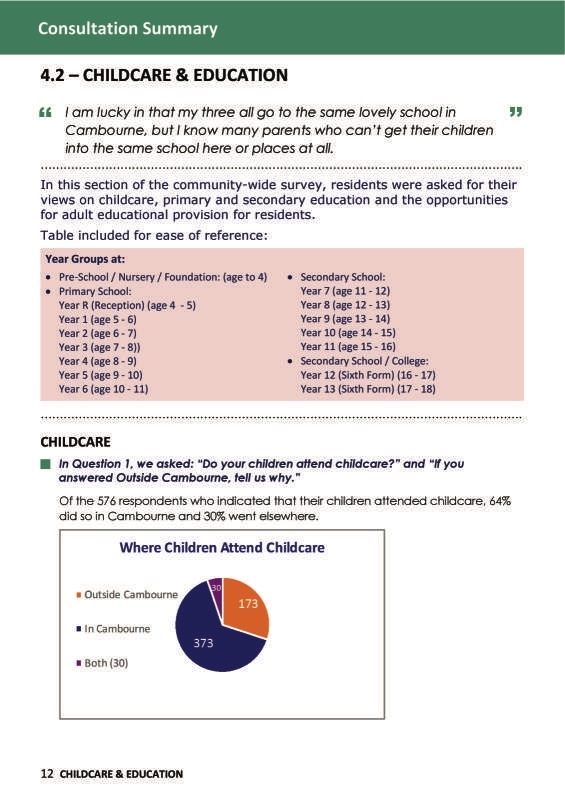 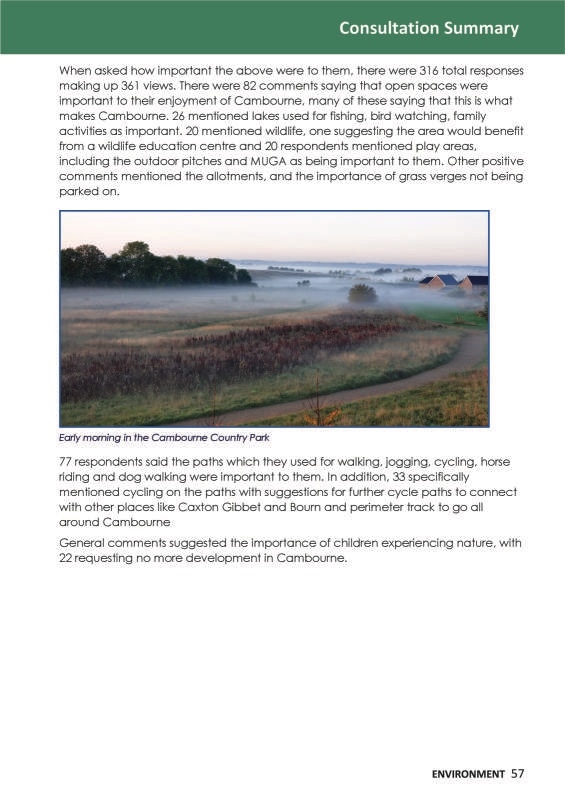 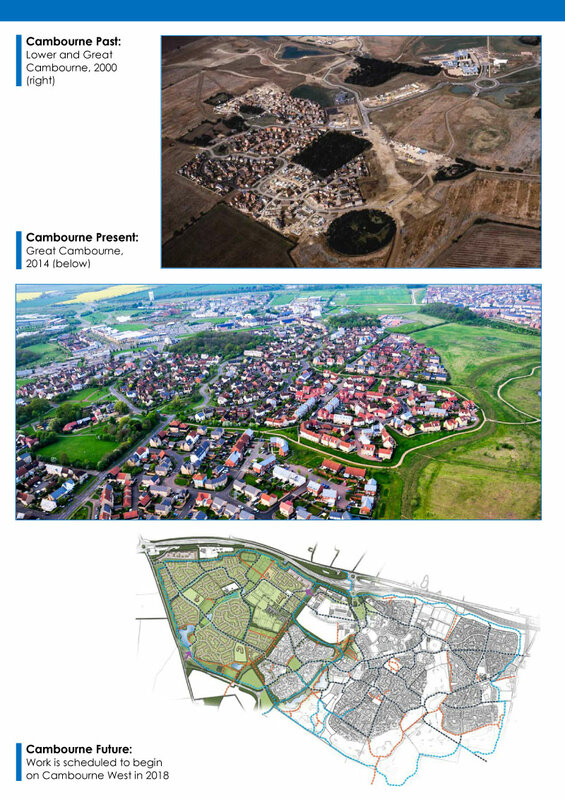 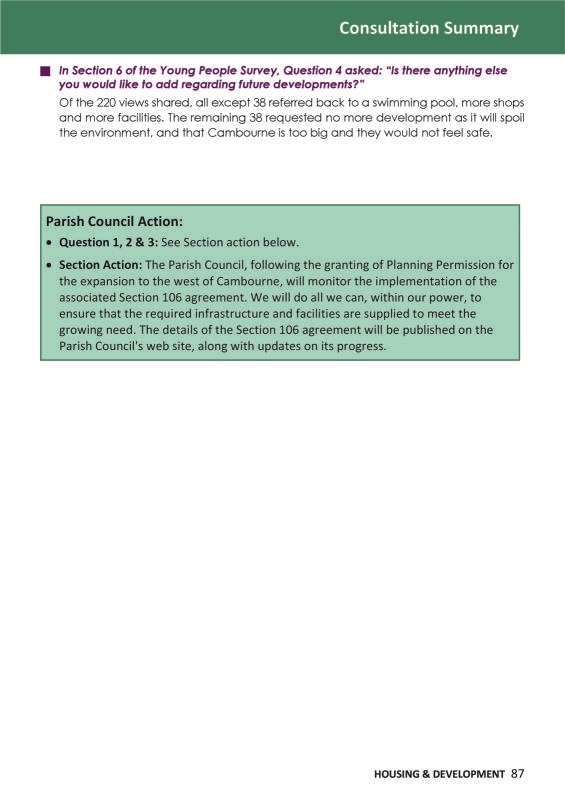 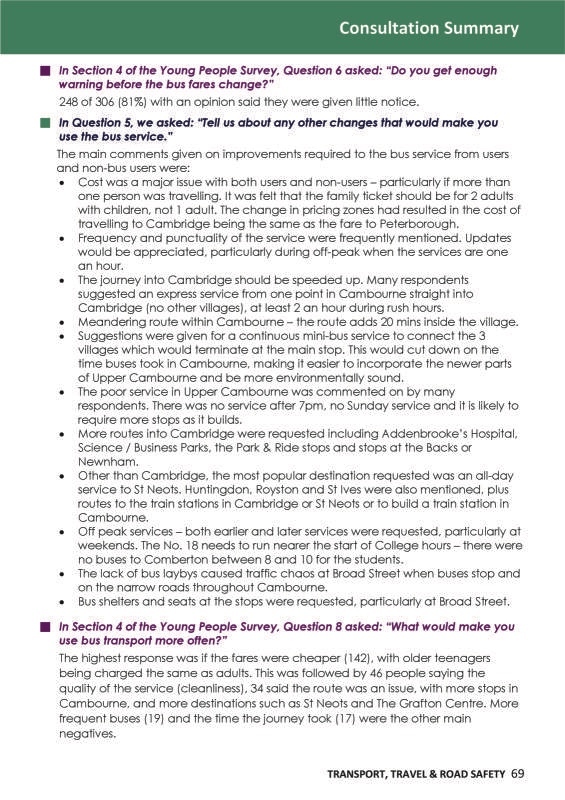 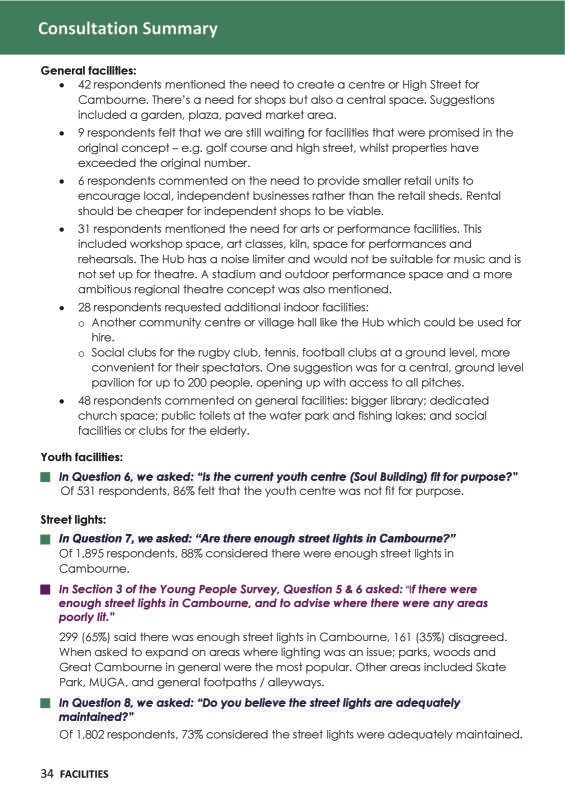 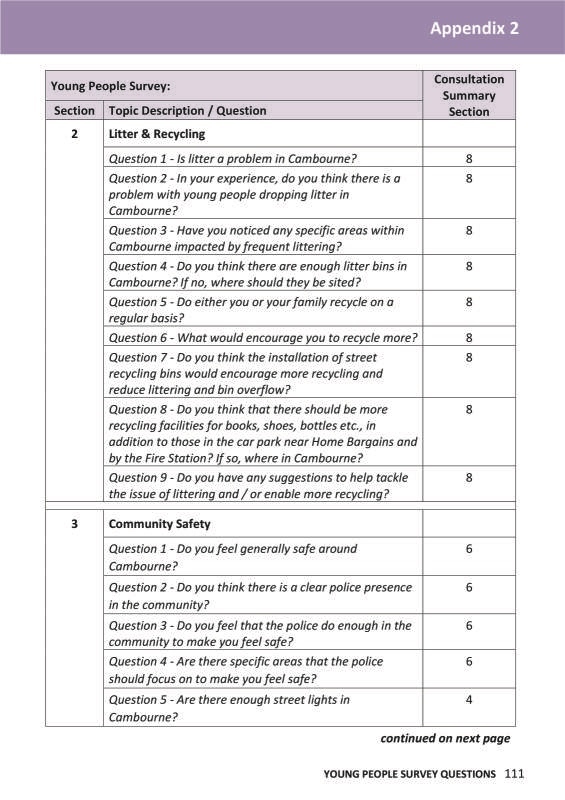 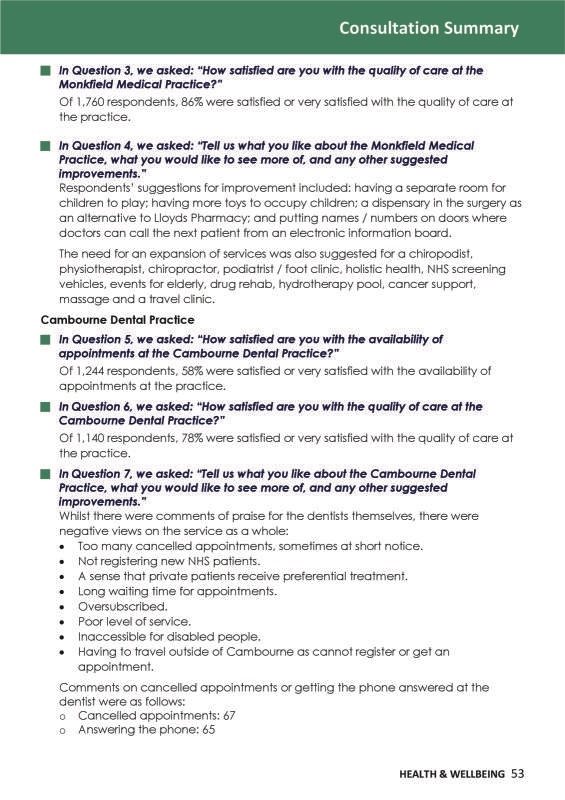 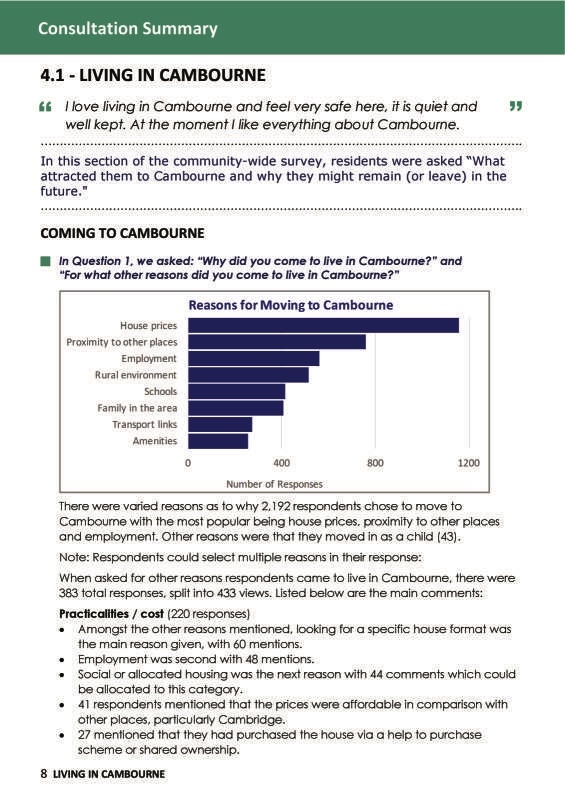 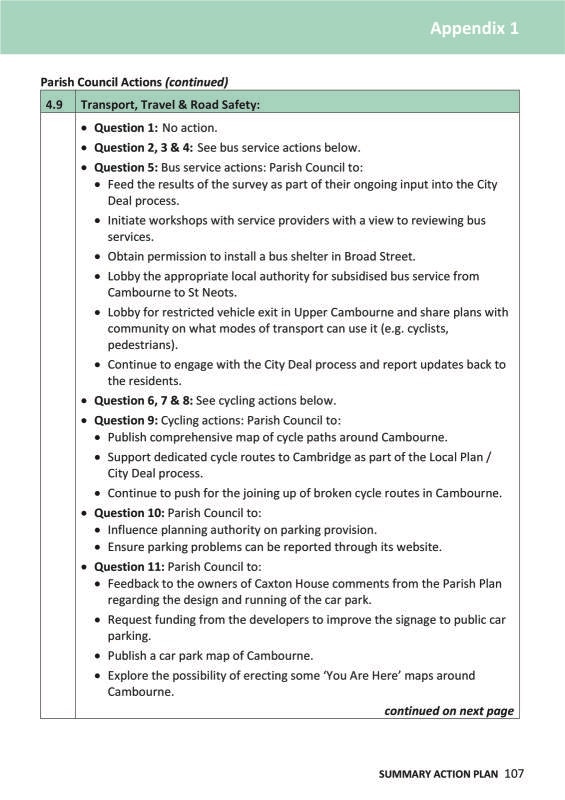 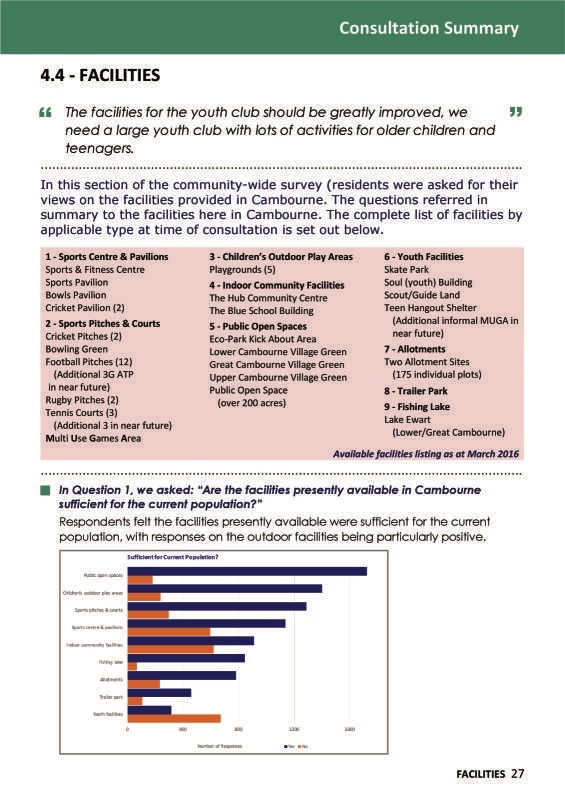 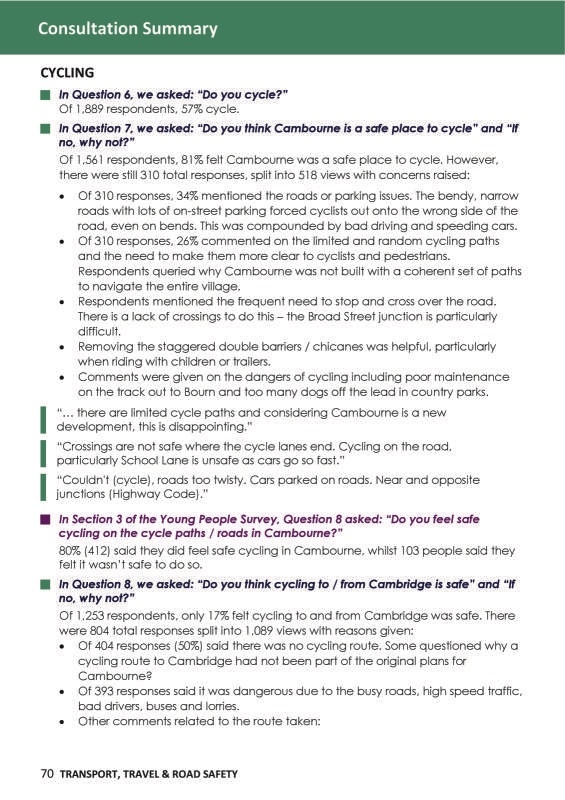 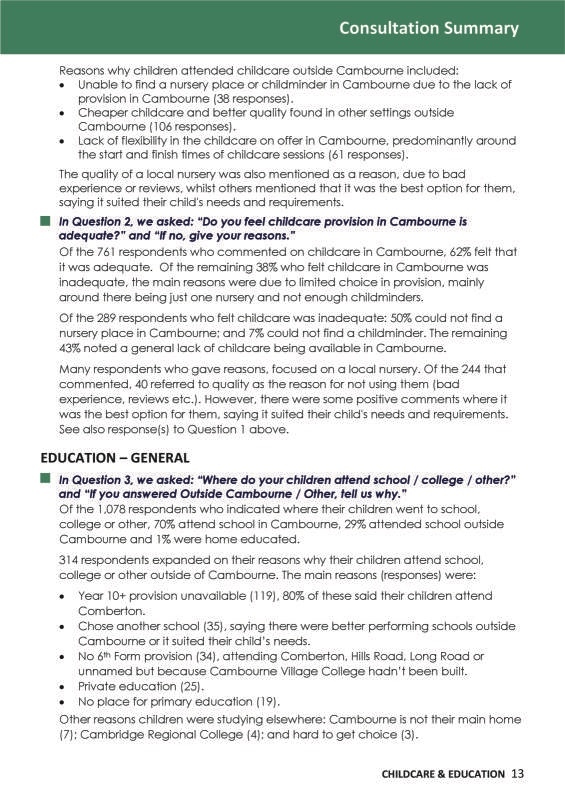 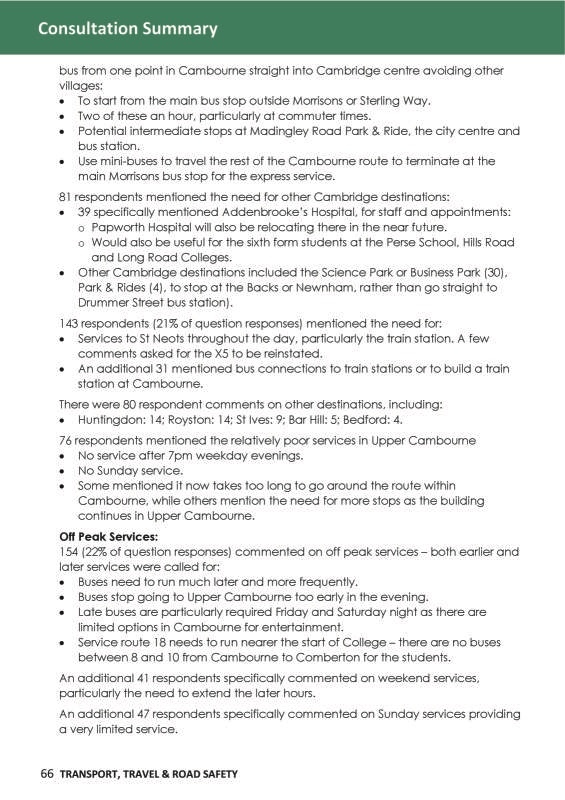 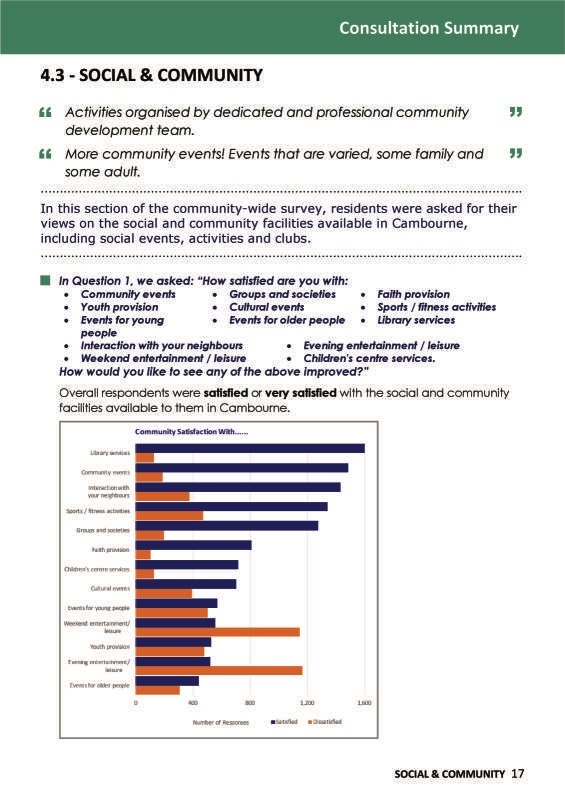 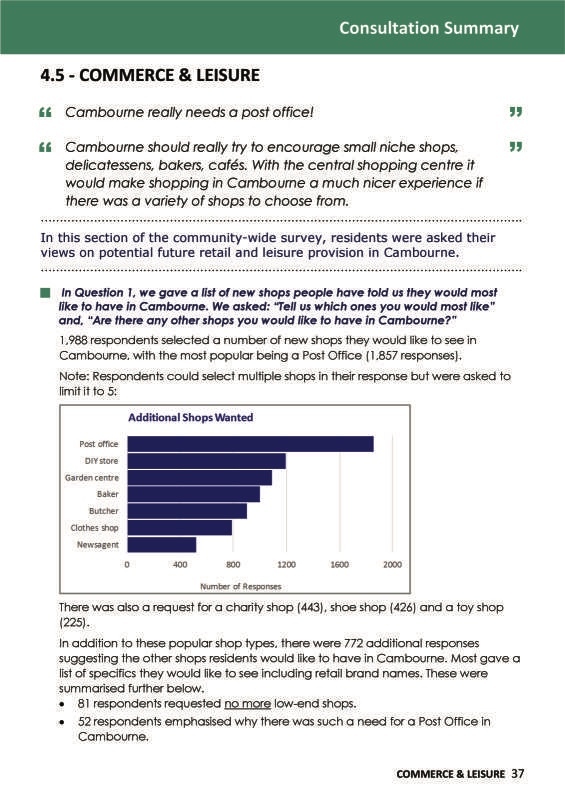 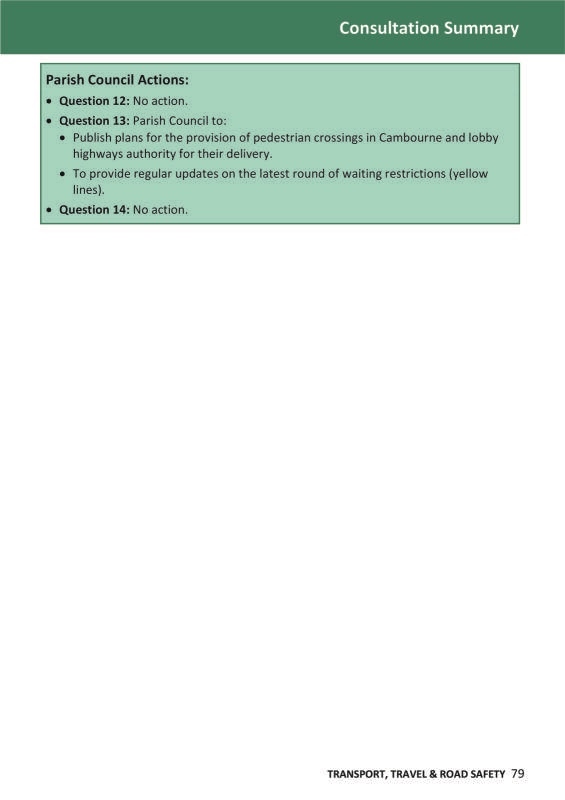 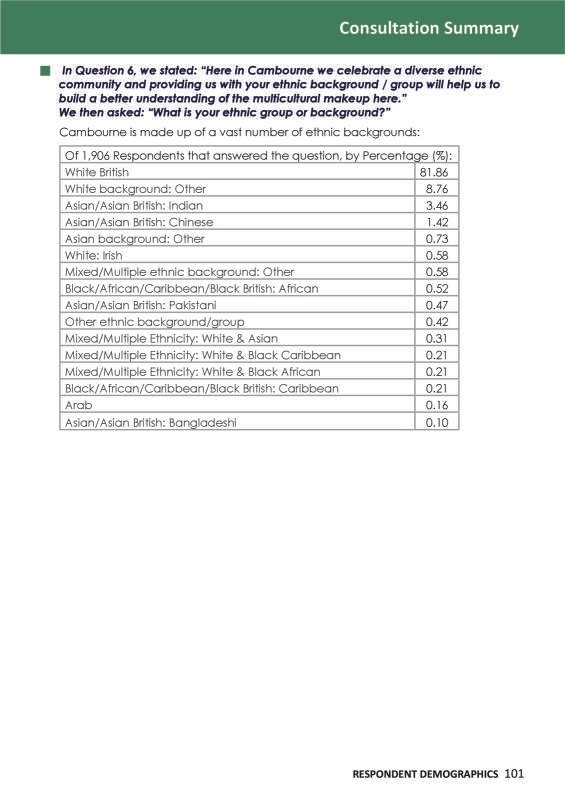 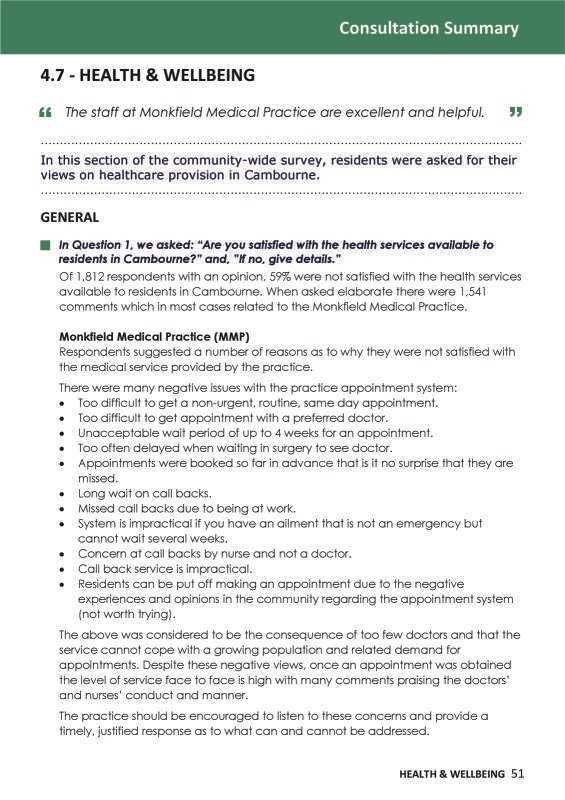 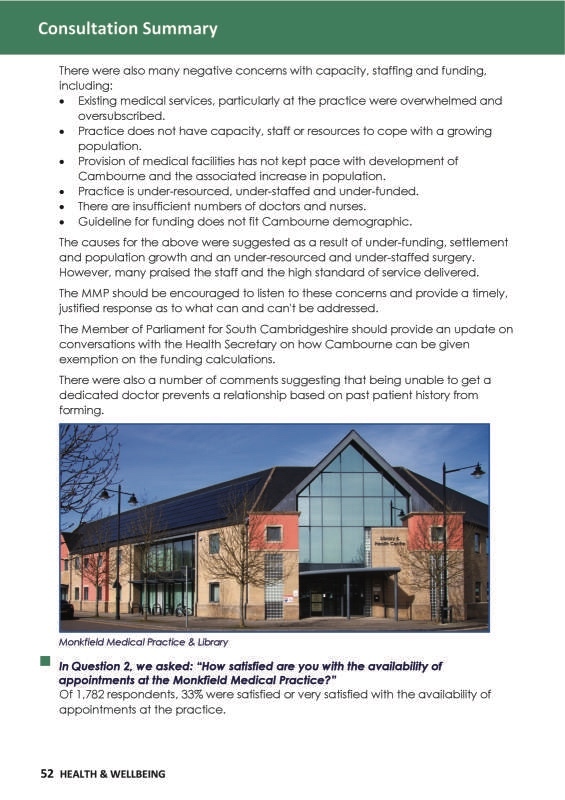 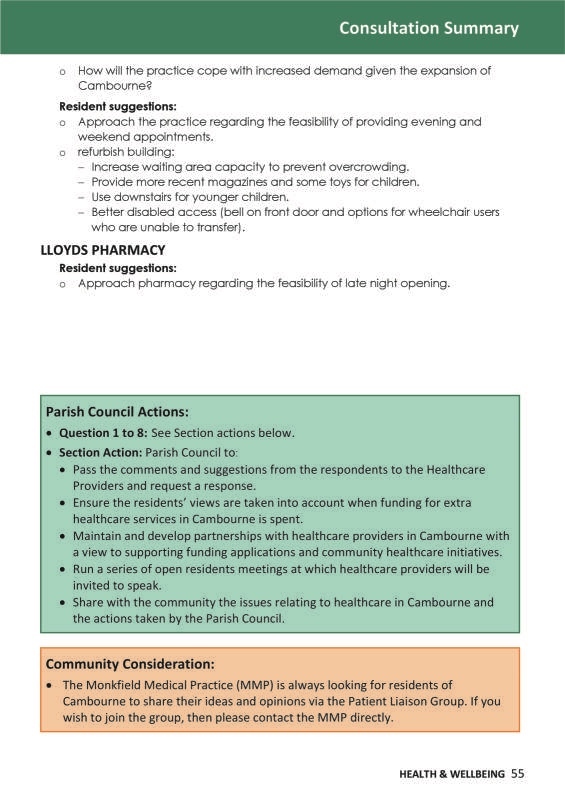 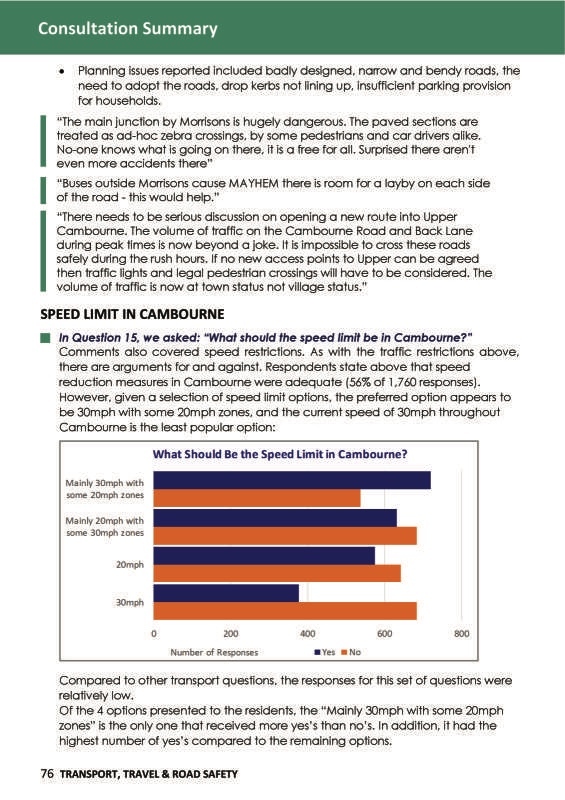 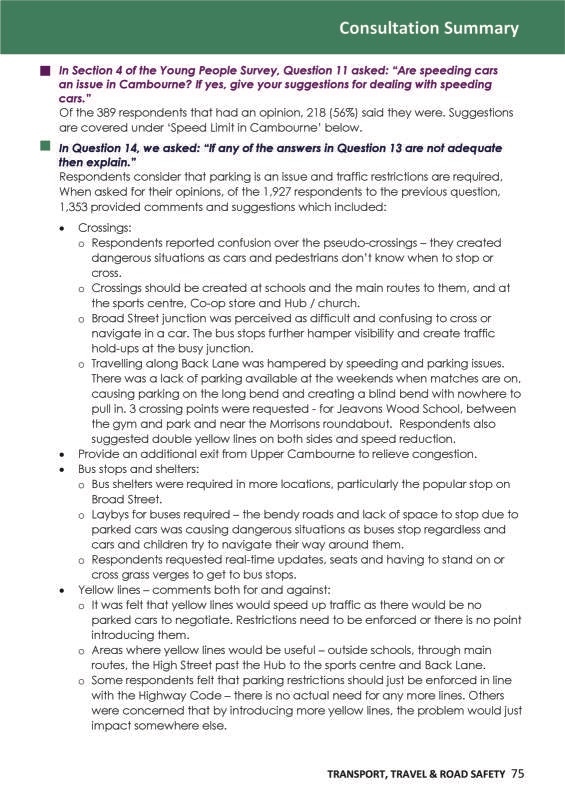 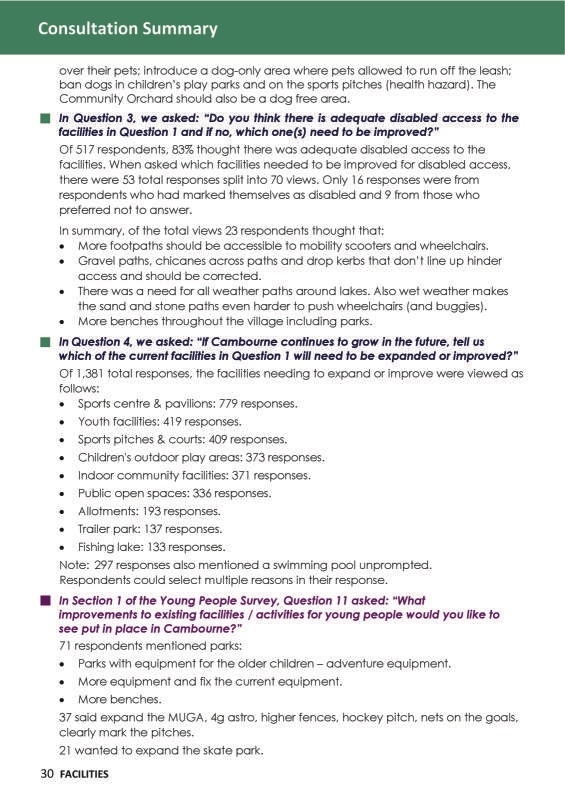 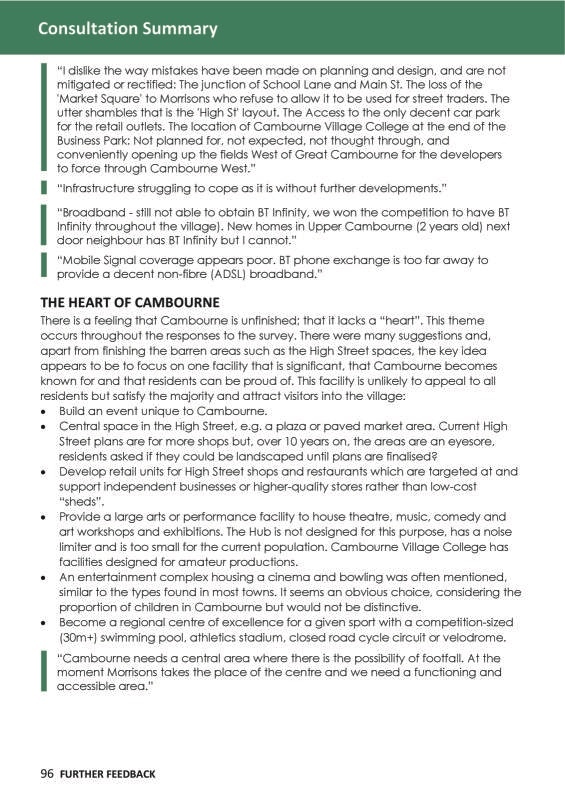 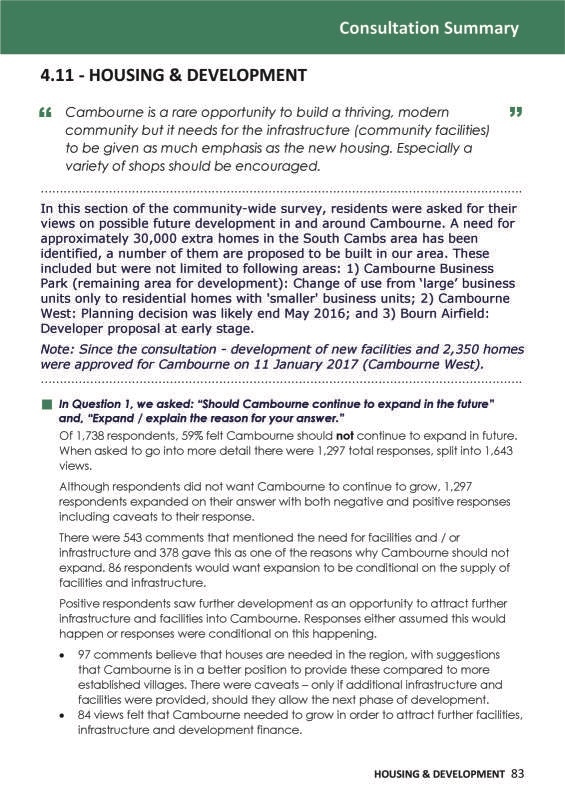 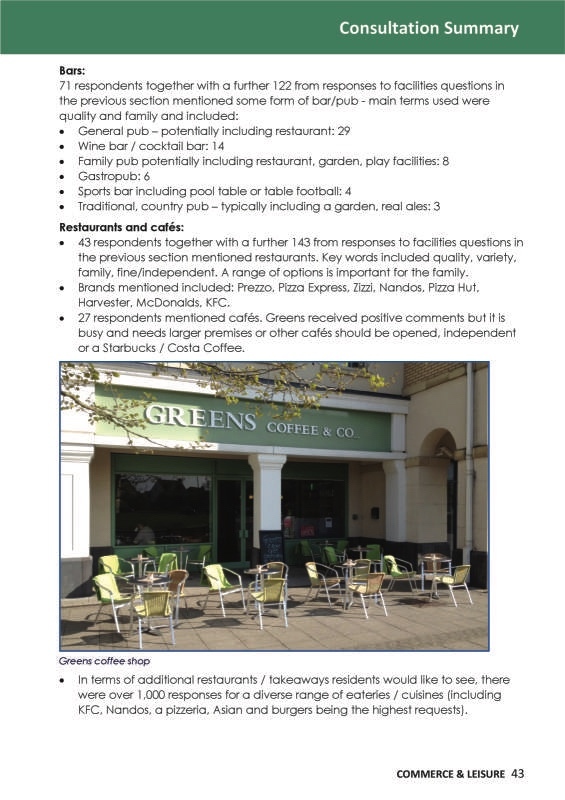 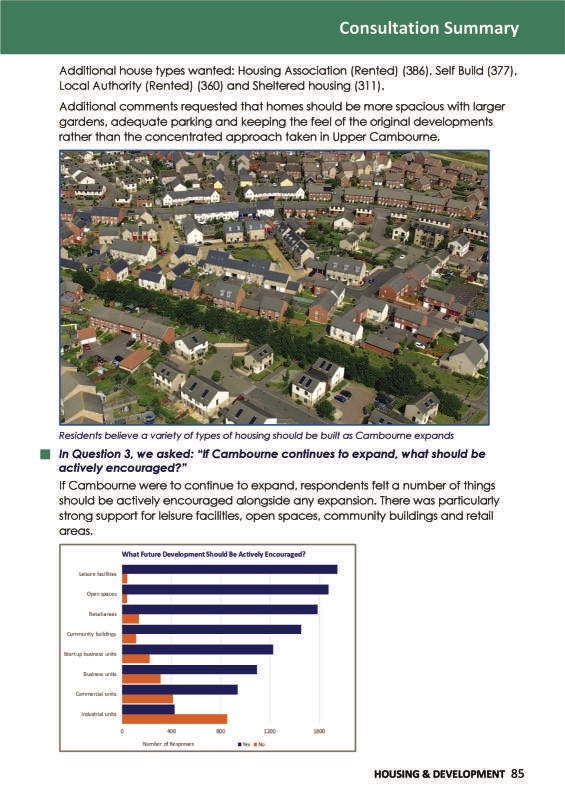 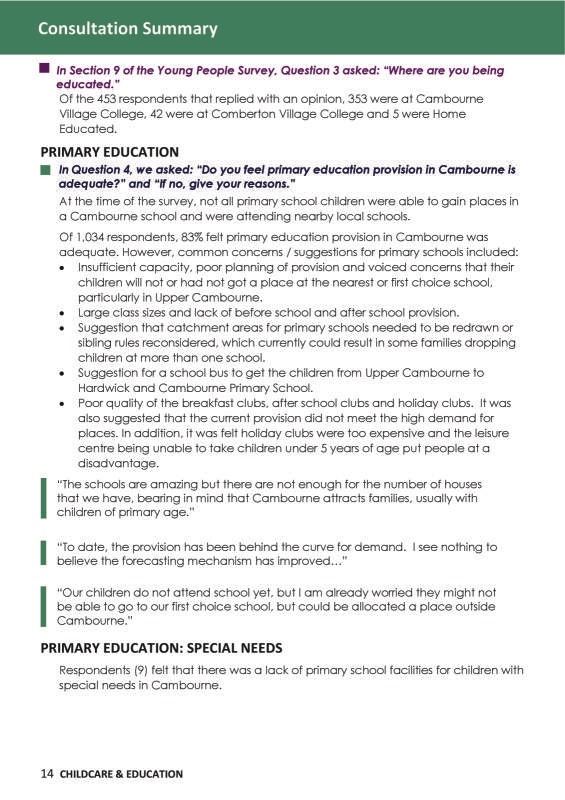 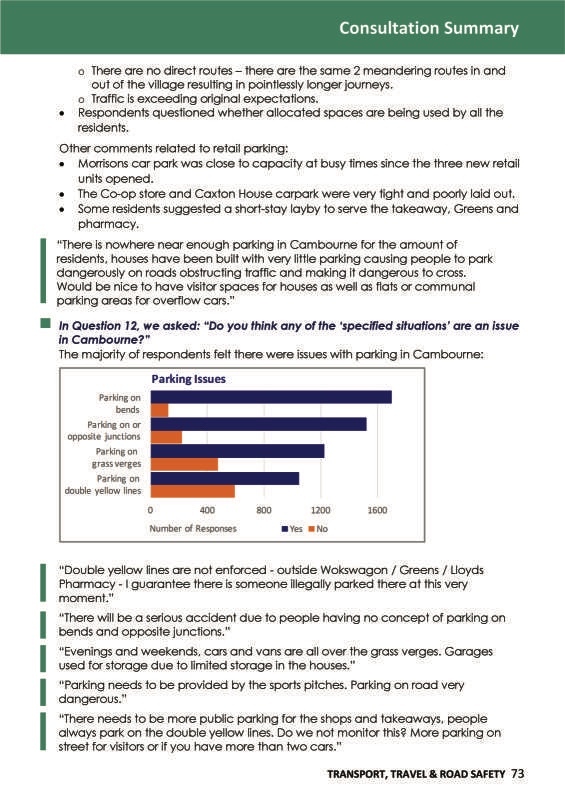 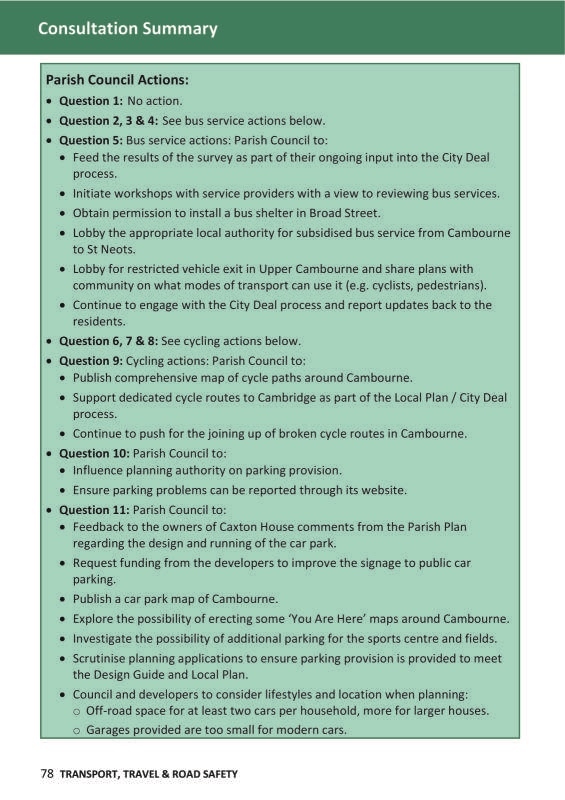 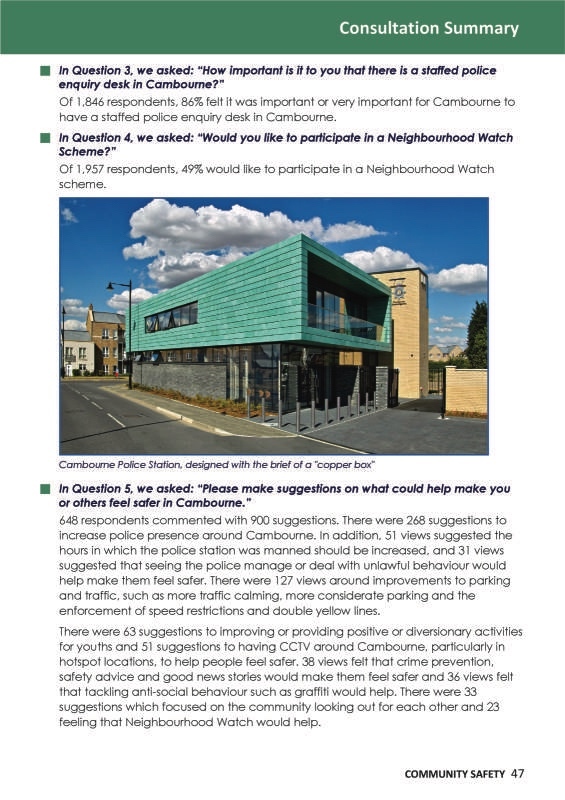 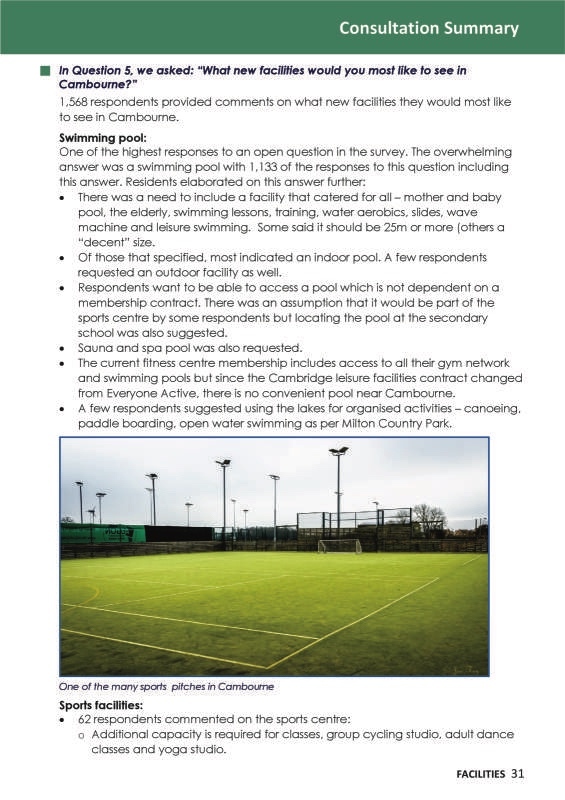 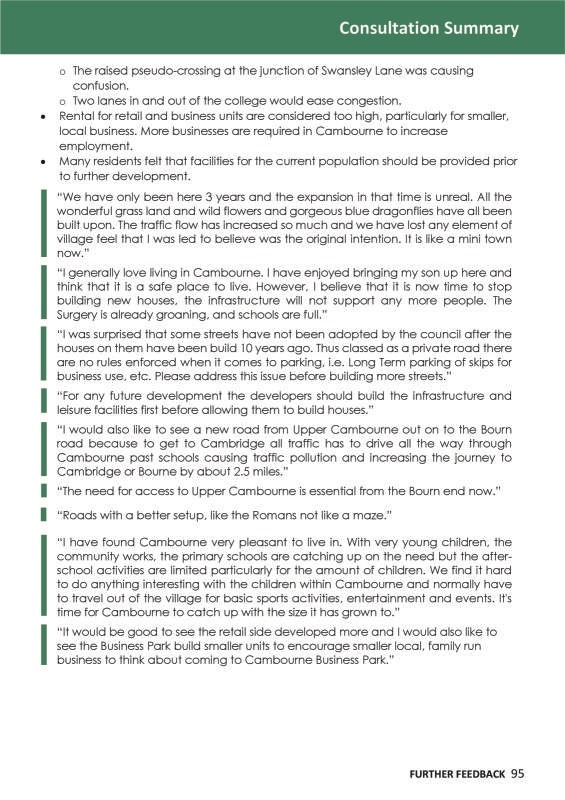 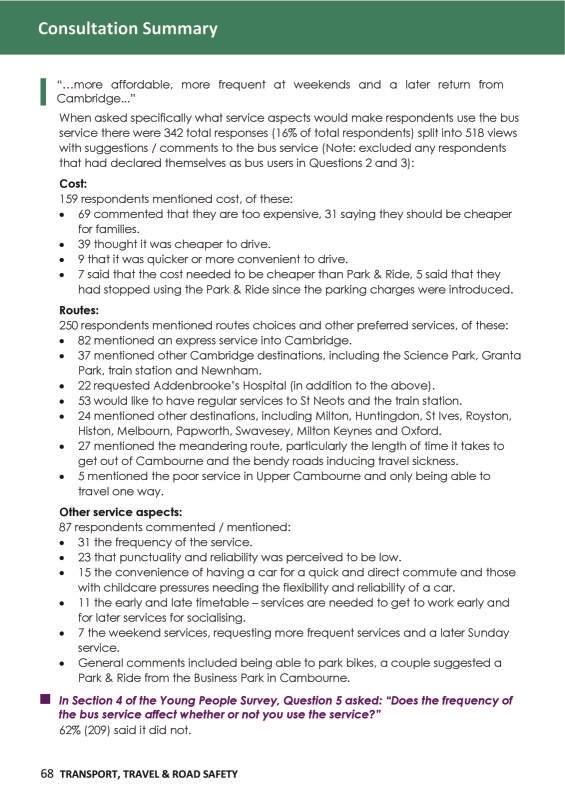 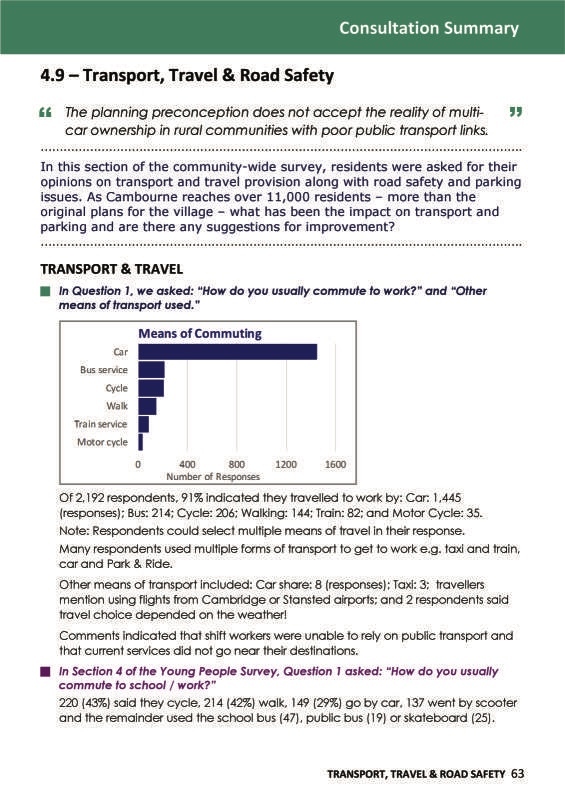 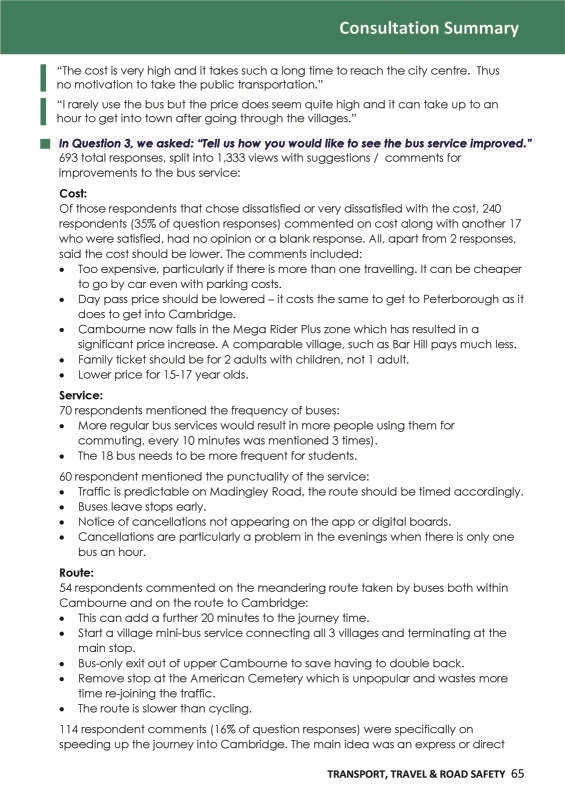 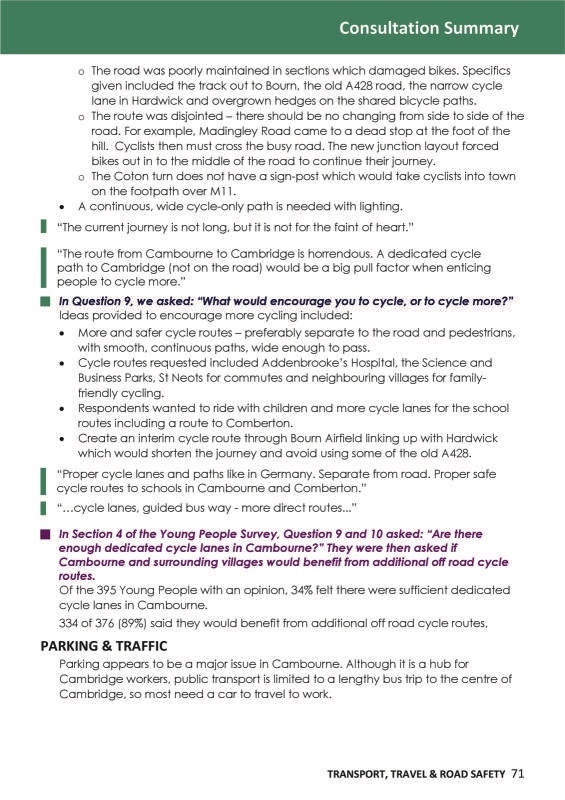 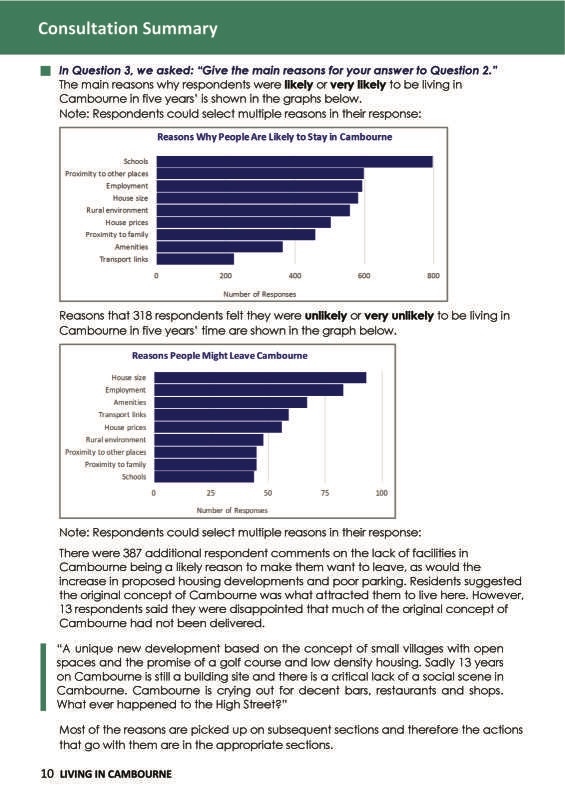 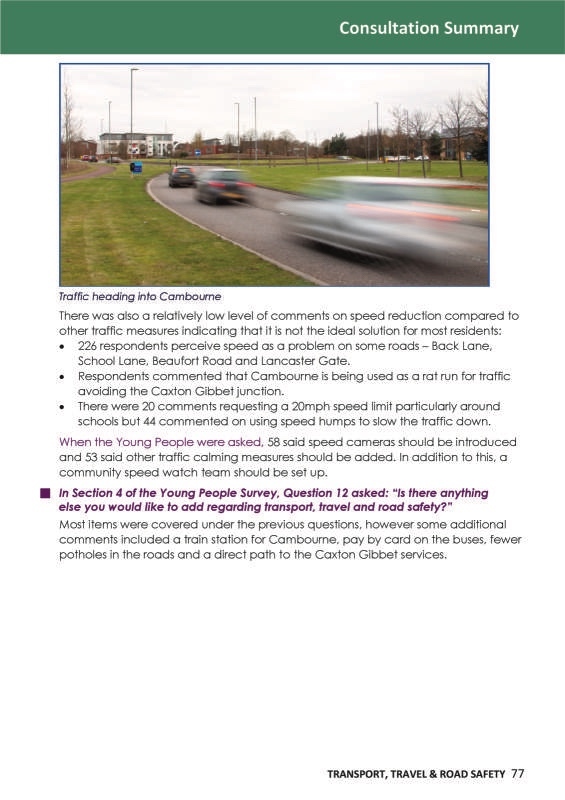 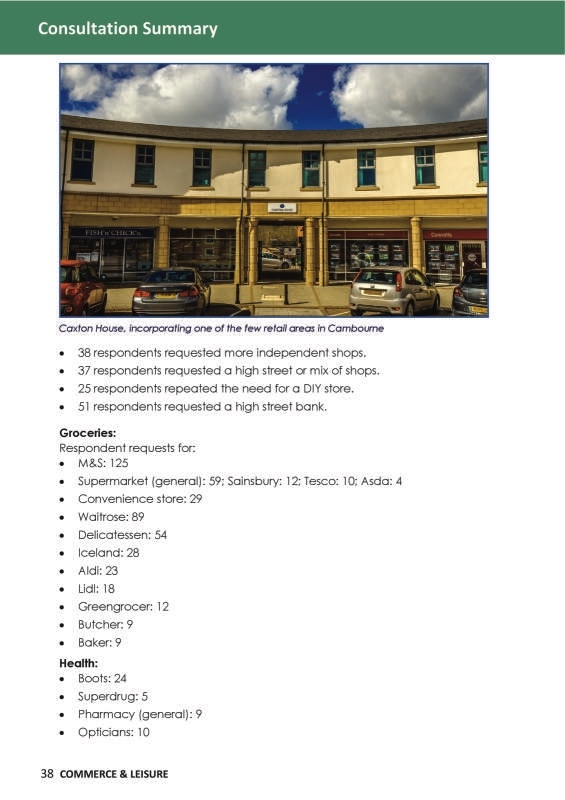 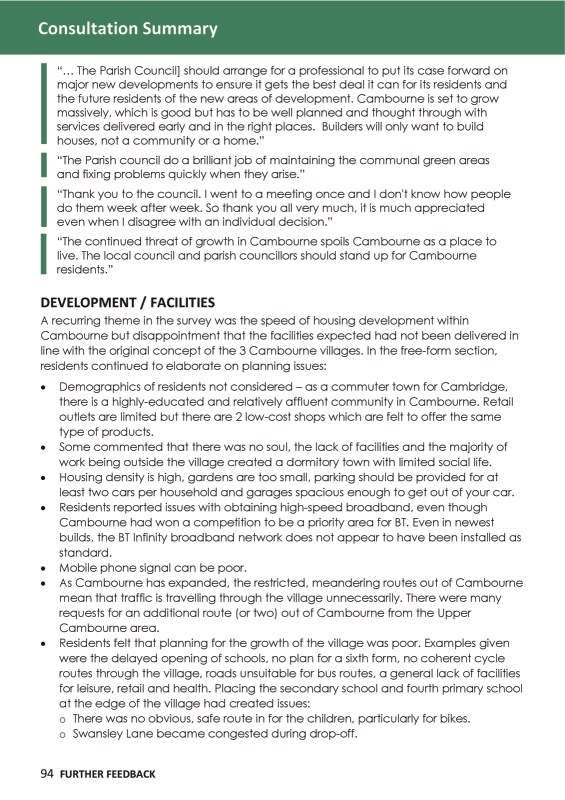 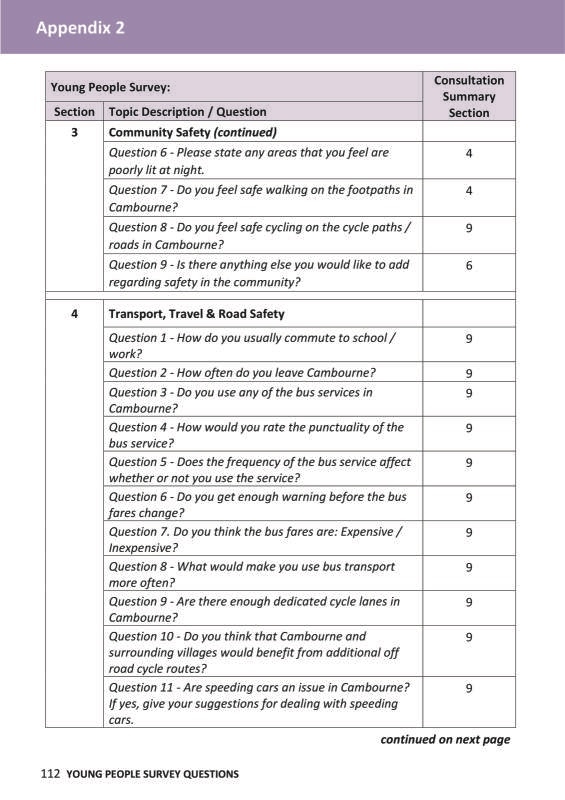 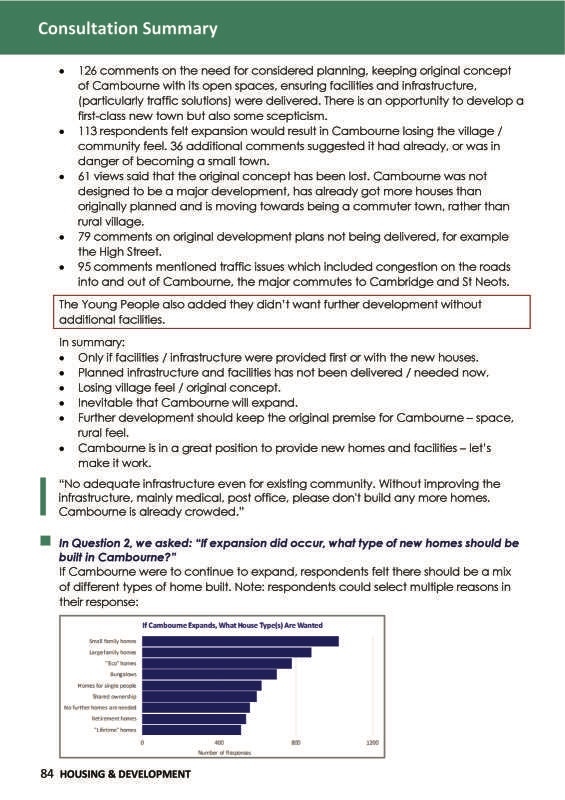 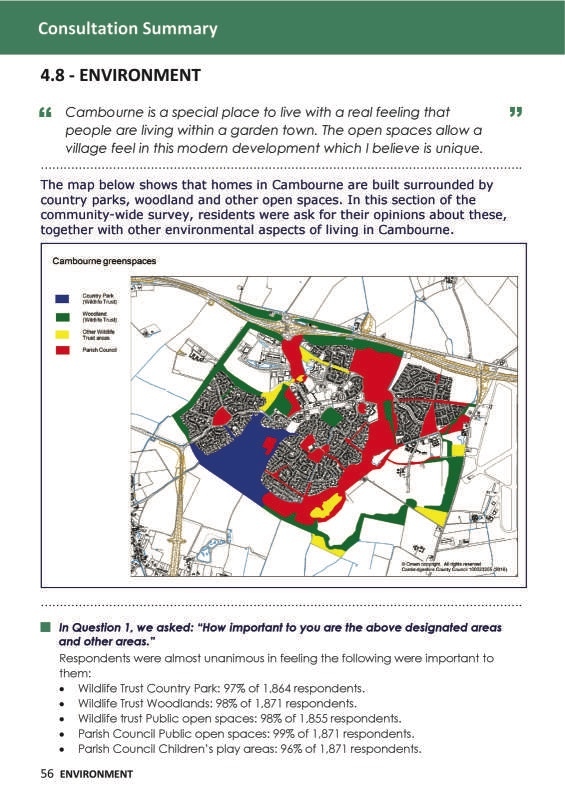 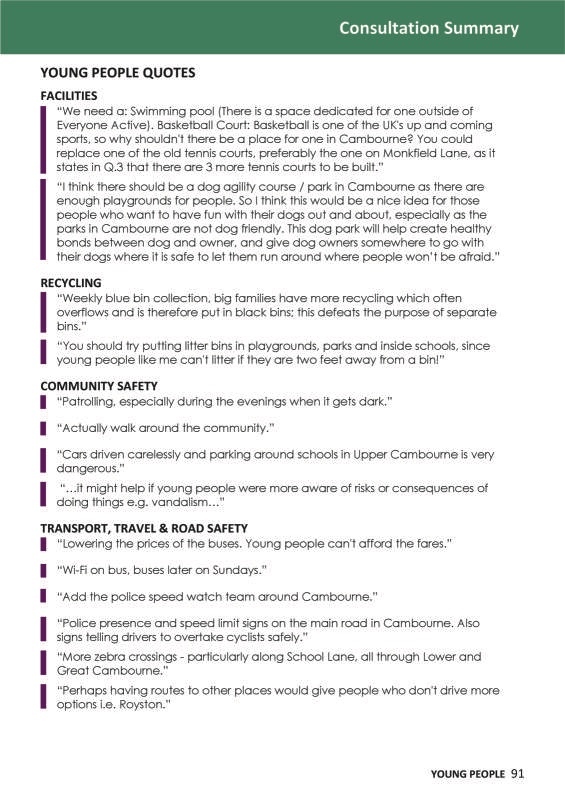 The Report also includes “Considerations for the Community” suggesting actions by the residents of Cambourne. 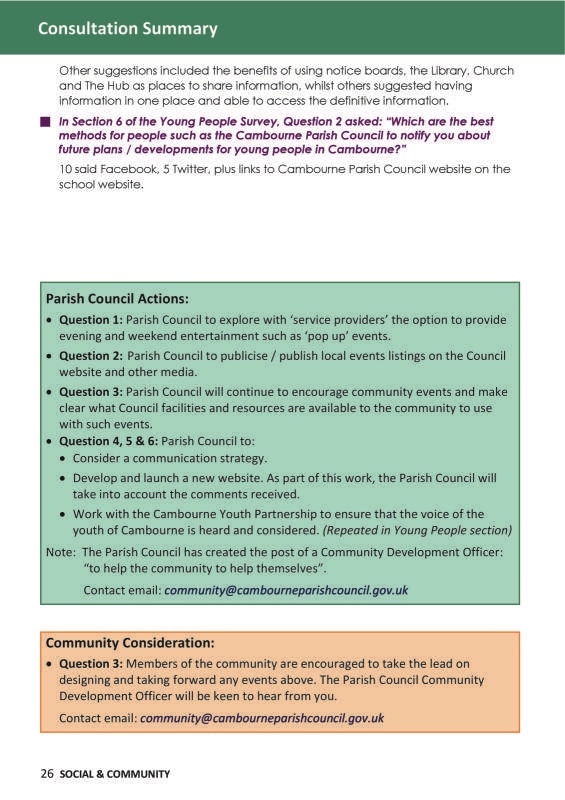 If you are interested in developing any of the community ideas detailed in the document – you can!